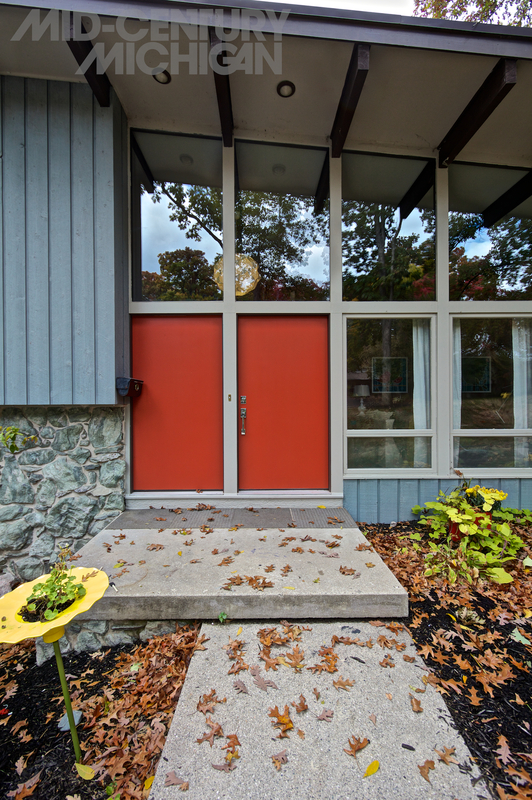 The family who lives in this 1952 James Bronkema home are no strangers to attention. Looking like an example of of the Case Study House program, their home would not seem out of place in a history book amongst other famous modern houses of the era. Its steel construction, large expanses of glass, and lush green roof have naturally sparked the curiosity of many passers-by. Strangers sometimes even approach the front door, only to be greeted first by the family’s two Chihuahuas (Ted and Ignacio, or “Nacho,”) before meeting the four person family that calls this classic home. Sundays seem to be peak traffic time for the “cul-de-stalkers” as the family calls them, “when everybody gets out of church. They come with cameras. They shoot video. Some people will knock on our bright green door.” “The door color was our idea,” the son smugly adds, referring to his younger teenage sister and himself. 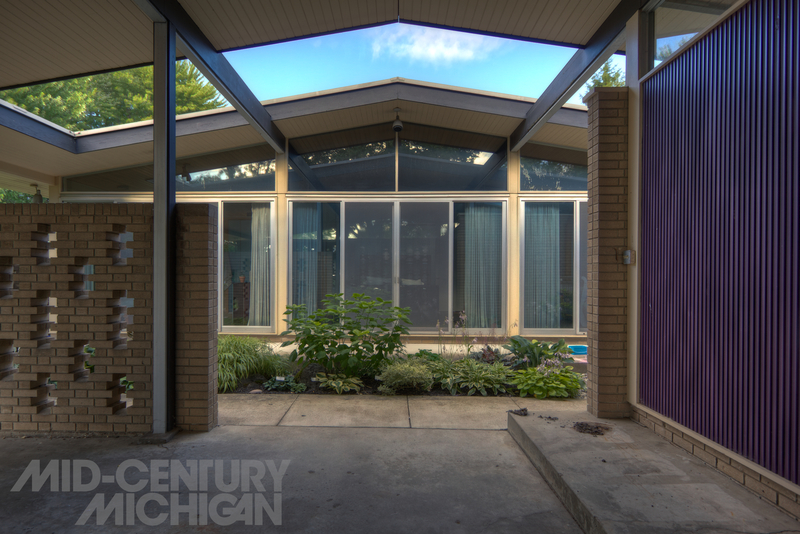 The family’s house is one of seven modern homes on their dead-end street, all built in the 1950’s by James Bronkema. 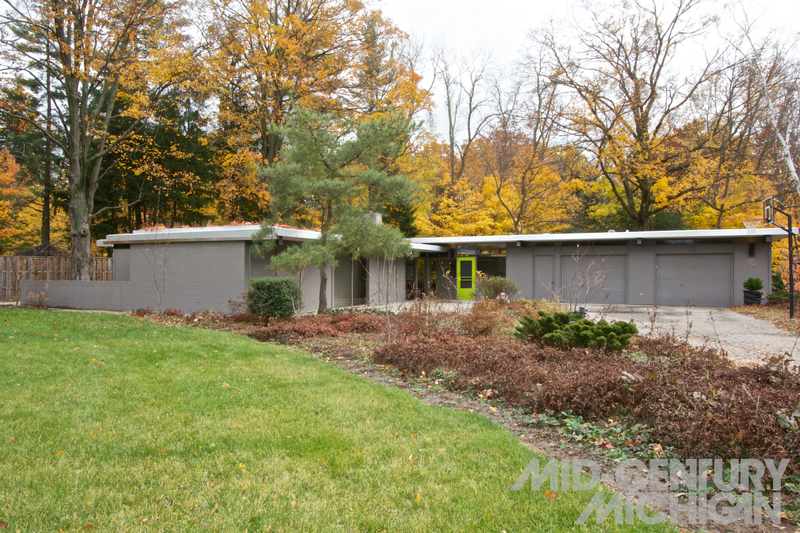 At the time their home was built, a young James (Jim) Bronkema was making a career for himself constructing notable modern homes around Grand Rapids and selling real estate. 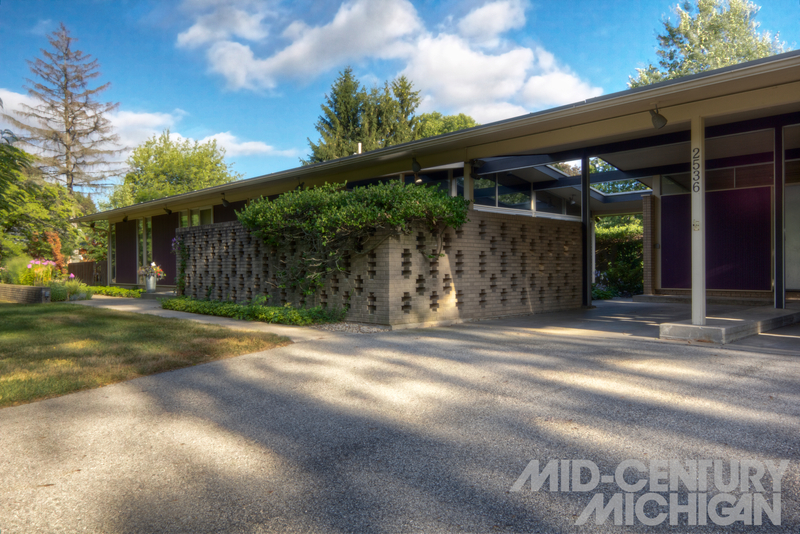 Shortly before their home was built, Bronkema purchased the lot on which he would later develop this modernist enclave the family calls their neighborhood. Their home was the first to be built, and was commissioned by Frederic Fay, who made his living in the furniture industry. His son, Brad recounts how the home came to be. 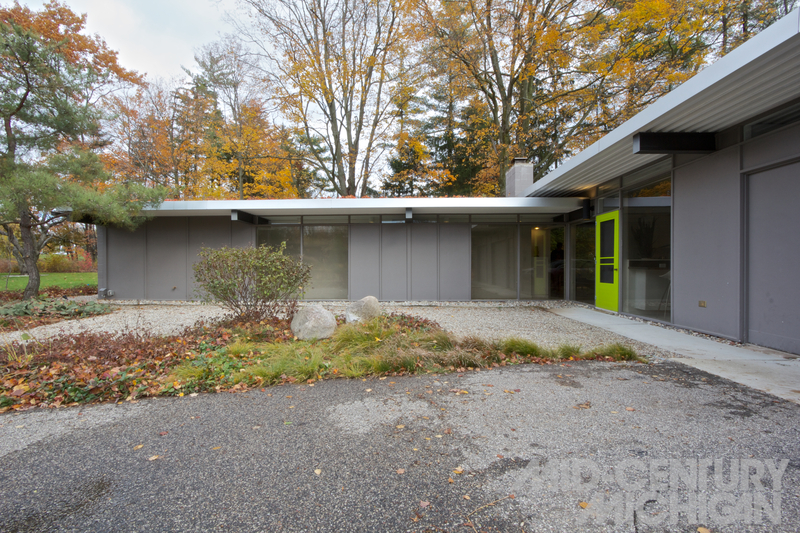 “My dad was very interested in modern architecture, and so when he heard about Jim Bronkema, he was really excited to do this house. He worked closely with Jim on the design of the house, as he himself was not unfamiliar with a drafting board. Construction began in 1952, and in 1953, we moved in. One of the touches my dad left was a drafting table built into the dining room area. Behind some folding doors, it would emerge, and there he would often do his work in the evenings.” Brad would continue to live in the home until he was around eight years old. 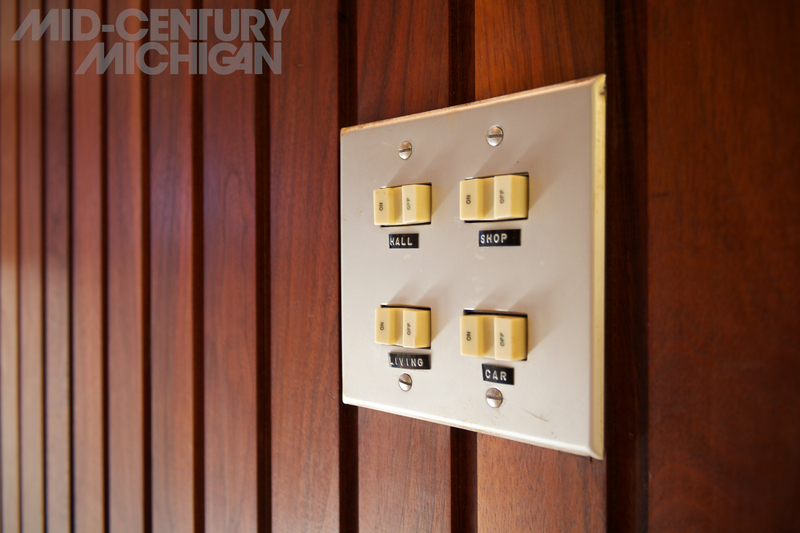 The challenge of climate control in a mostly glass, concrete, and steel home in Michigan was one of the many challenges the current owners had to consider when they purchased the home in 2006. The flat roofline turned out to be a perfect match for the living green roof they installed, which insulates the home in both hot and cold weather. The home’s floors had embedded ductwork made of cardboard laminated with tar that had rotted and become moldy. Their daughter recalls, “when we first looked at this house, I said ‘this place smells disgusting. I don’t want to live here!’” “So the kids learned a lot about general contracting early on,” the father jokes. “We ripped it to the studs. We had a bobcat in here at one point to rip out the old concrete slab and had new concrete floor with radiant heat poured.” The family moved into the home in December 2007 after their intensive renovation. In total, it took about 8 months for remodel. “And in the end, the kids still did well in school through the intensive ordeal, and we’re still married,” jokes the mother. 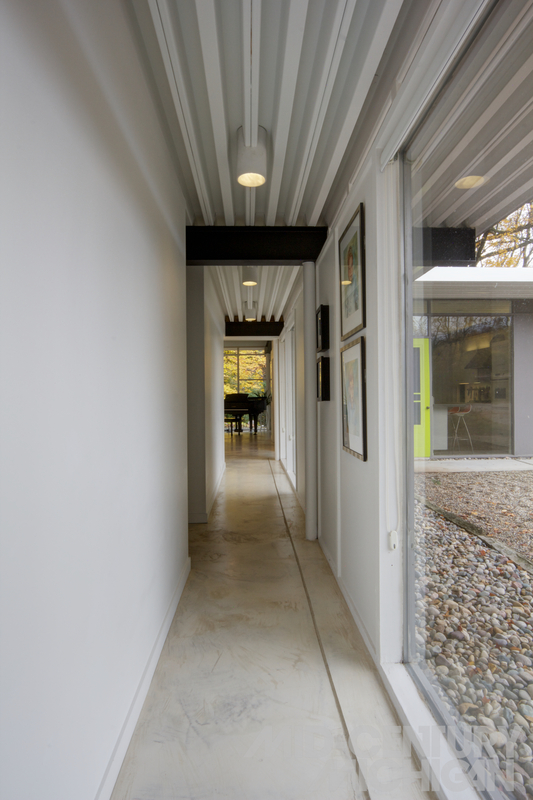 Because of the house’s high level of transparency, curating the outdoor spaces became an area of focus for the family. 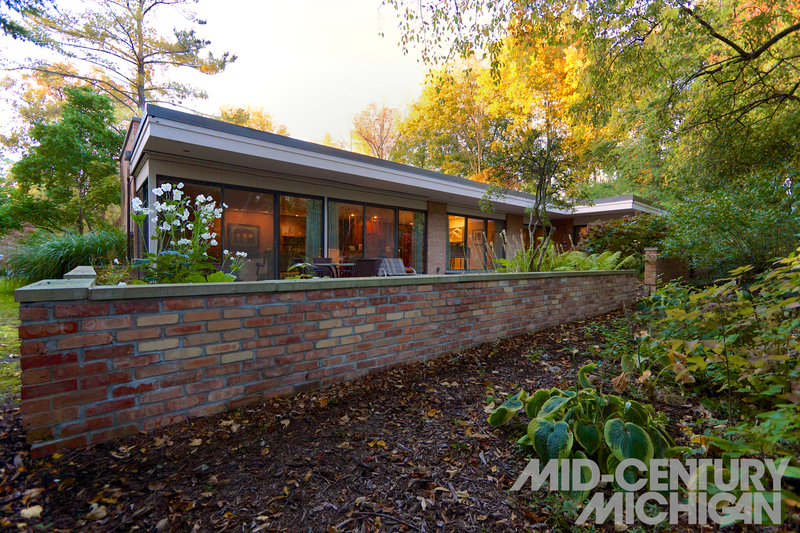 “The yard is entirely Michigan native plants, meant to be low-maintenance. We pulled out any non-native plants early on,” they mention. When it precipitates, the roof drains into a main cistern used to water the backyard. 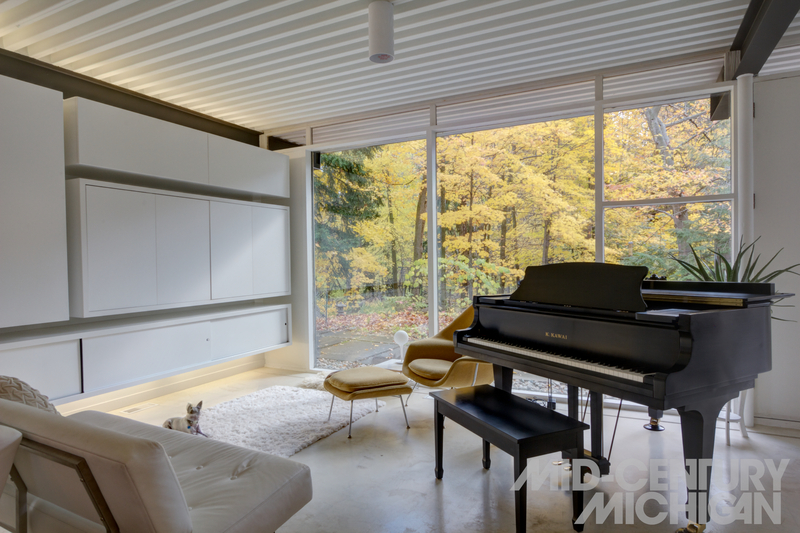 Behind the house the wooded lot features a sunken patio, a serene reflecting pool, and outdoor kitchen, covered by the cantilevered roof. The front and side yards are overtaken in the spring and summertime with wild strawberries which serve as not only ground covering, but a tasty snack for both the family, and the dogs. Closer to the road, the family keeps a prolific vegetable garden, which provides a variety of fresh ingredients for their creative vegan meals. In a sheltered area behind the master bedroom, a sculptural red slate fountain gently bubbles, creating a serene soundtrack for when night falls. Flowing like a black river outward from a glass wall in the master bedroom, a collection of Mexican beach pebbles aligned in a sinuous form help direct drainage away from the home. No detail was spared curating the exterior. Even the power lines running to the home were buried as to not detract from the atmosphere. 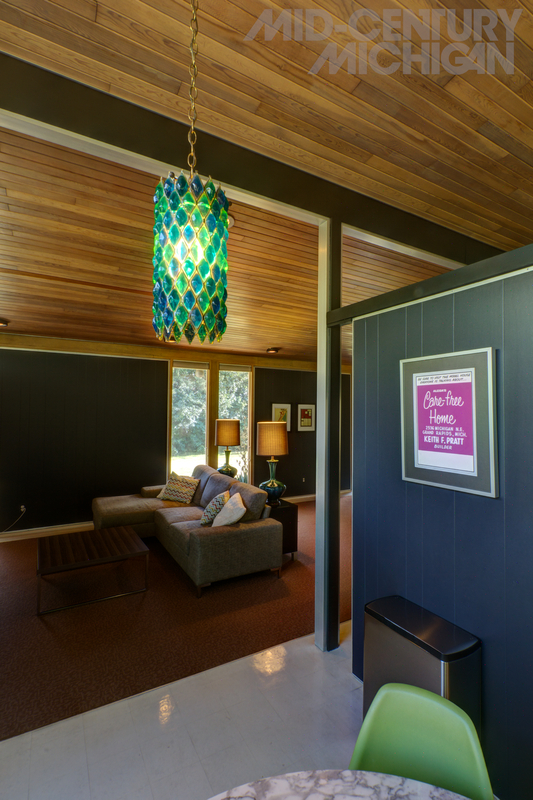 When it comes to the interior, the family reached out to their late friend, Nancy Phillips for advice. (Nancy met her husband, graphic design legend Steve Frykholm while working at Herman Miller in spatial planning.) “Nancy was instrumental with giving feedback on our house,” they state. “Many times, we asked ourselves, ‘what would Nancy do?’ We remember her saying ‘It is better to have a dirty light-colored floor than a clean dark one.” Noticeably, the concrete floors have a white finish. 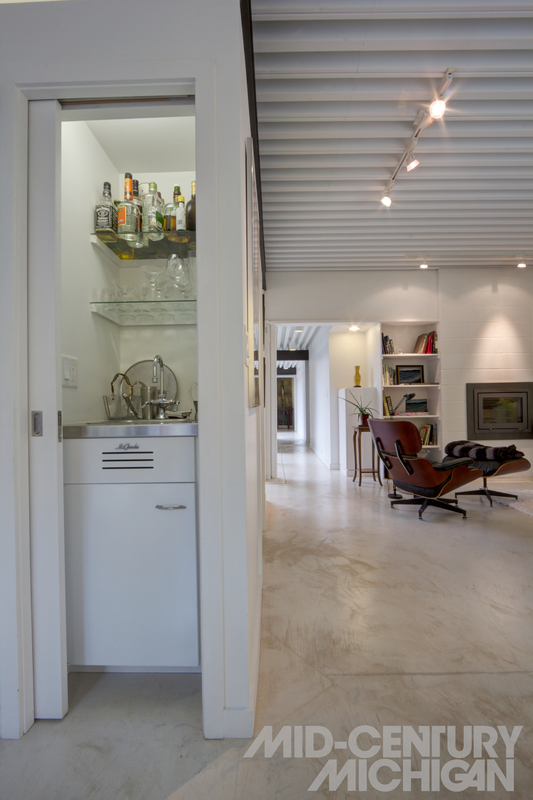 One of the family’s proud contributions to the interior is the design of the floating cabinetry in the main living area, which houses the entertainment center. 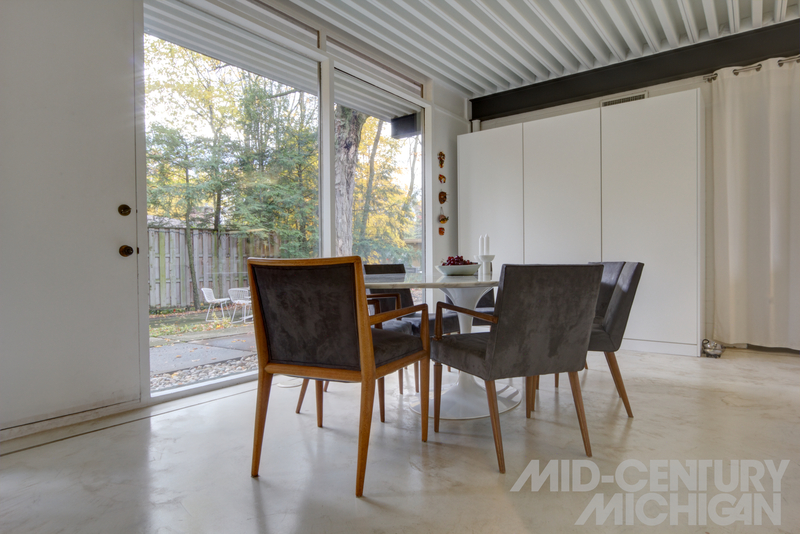 “The form was inspired by Donald Judd, and helps us hide clutter.” Mid-century modern furniture mingles alongside contemporary pieces throughout the living spaces. 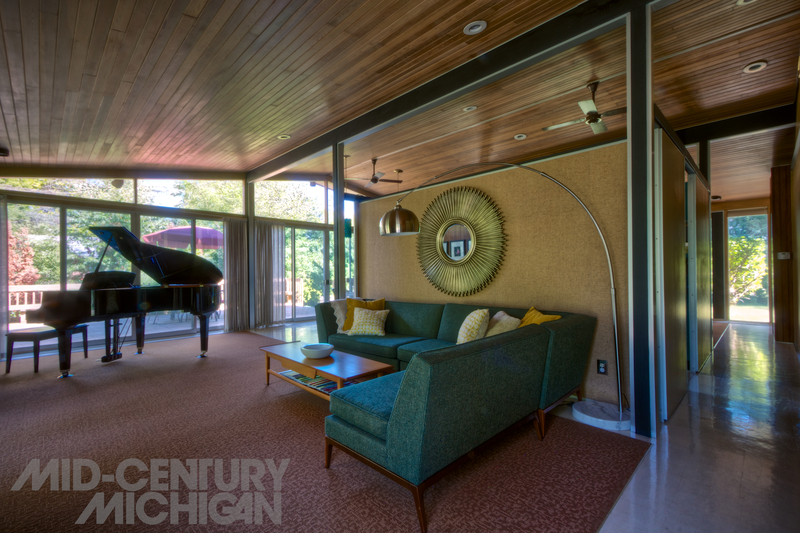 The centerpiece of the living room is a K. Kawai grand piano, which the family’s daughter plays. The bedrooms feature custom built-ins for desks and shelving, and elevated bedding with cabinetry filled with storage below. 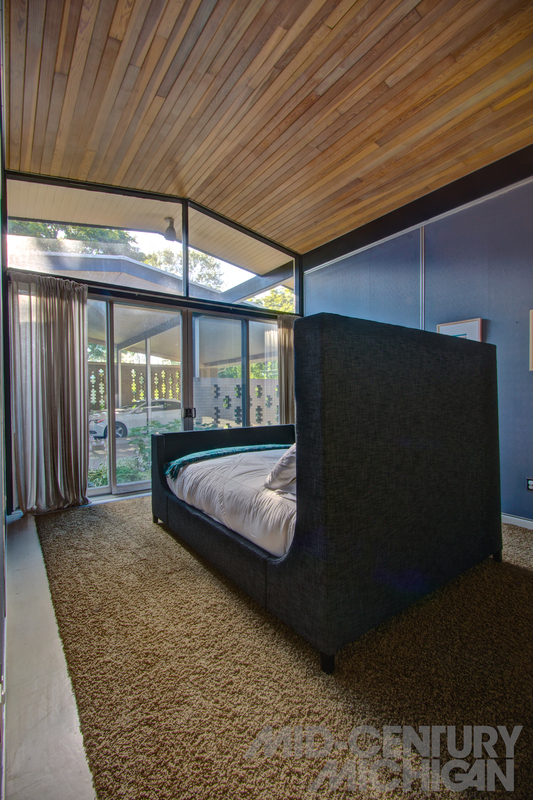 The only major modification to the footprint of the house is a very small addition to the master bedroom, just large enough to fit a bed. 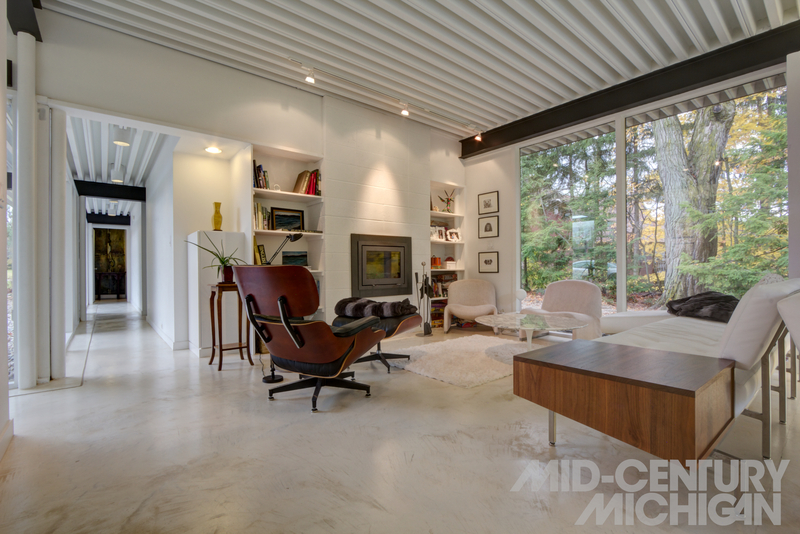 Because the same corrugated steel ceiling is no longer readily available, the addition is the only place a flat ceiling is seen. 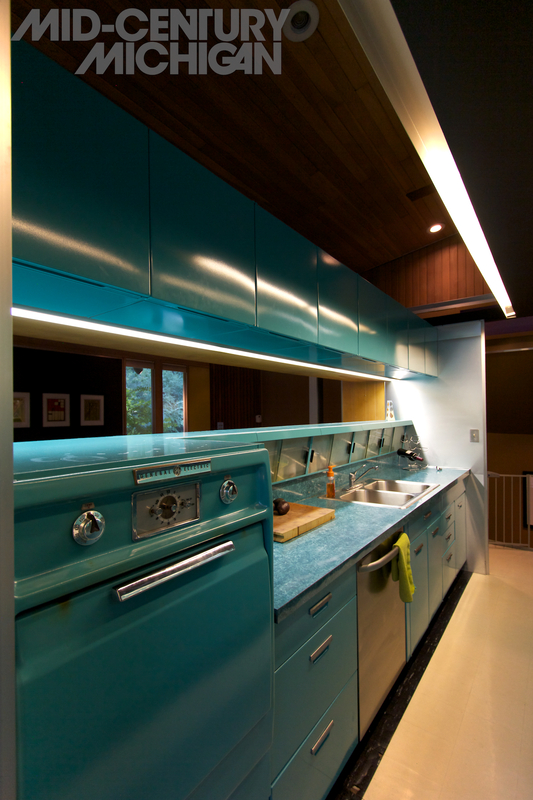 In the kitchen, original white enameled steel St. Charles cabinets look as new and sleek as they day they did when they were installed. 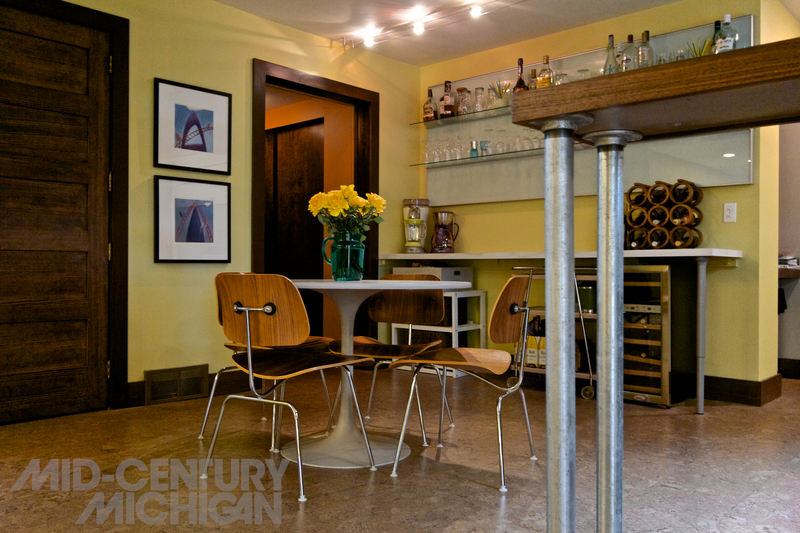 “The wet bar found around the corner in the dining area behind a pocket door was part of the original kitchen,” they mention. “It was so cool that we wanted to have it somewhere, but not have it be the centerpiece.” Stainless steel appliances and a wraparound stainless countertop add a high level of function to the L-shaped gourmet kitchen. Throughout the home artwork is featured. 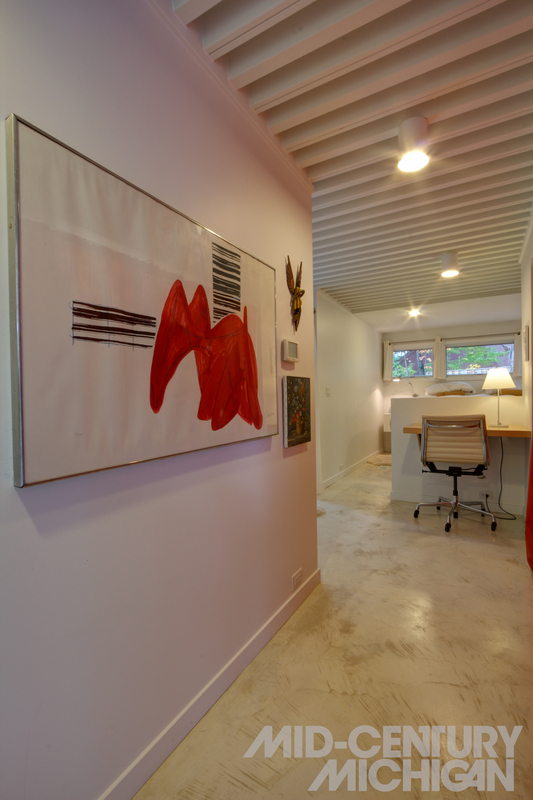 In the master bedroom hangs a hand-numbered signed lithograph by Alexander Calder, depicting Grand Rapids’ own La Grand Vitesse. The piece was a gift from grandparents of the family, and the primary blazing “Calder red” featured in the print inspired the color chosen for the curtains that cordon off the closet adjacent. Illustration Courtesy of Michael Nÿkamp of MKN Design. Flash back to April 21, 1967, when forty-five tornados ripped through the midwest, leaving a path of destruction from Missouri to Michigan. Grand Rapids witnessed at least two of these powerful vortexes, one one of which left a newly built modern home by Wayne McClure in shambles. When the lot and remaining structure consequently went up for sale, the neighbors across the street saw a potential to build a new home for their evolving needs, and purchased the wreckage. Using the foundational footprint of the original home, they commissioned architect Chuck Carter to rebuild something new out the remains. 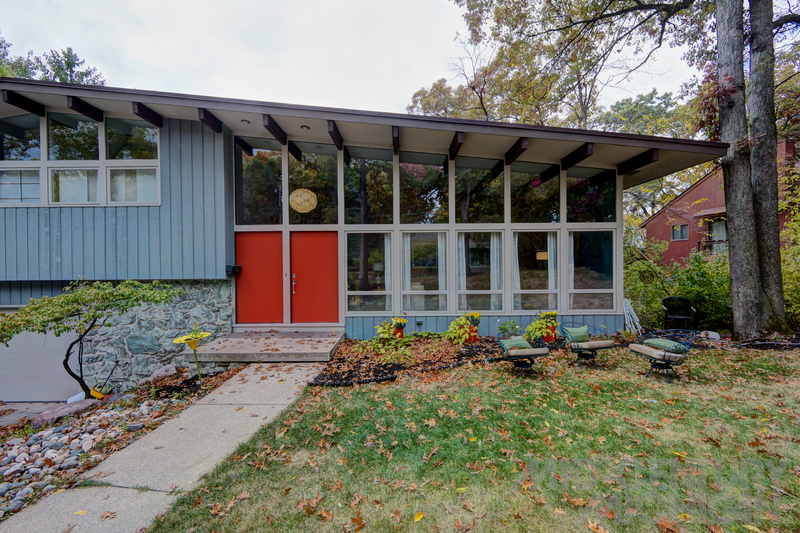 Looking at it today, is hard to imagine that in a neighborhood where mid-century modern houses stand out against their traditional counterparts, that one of the handsomest examples amongst the bunch was once a dilapidated structure. 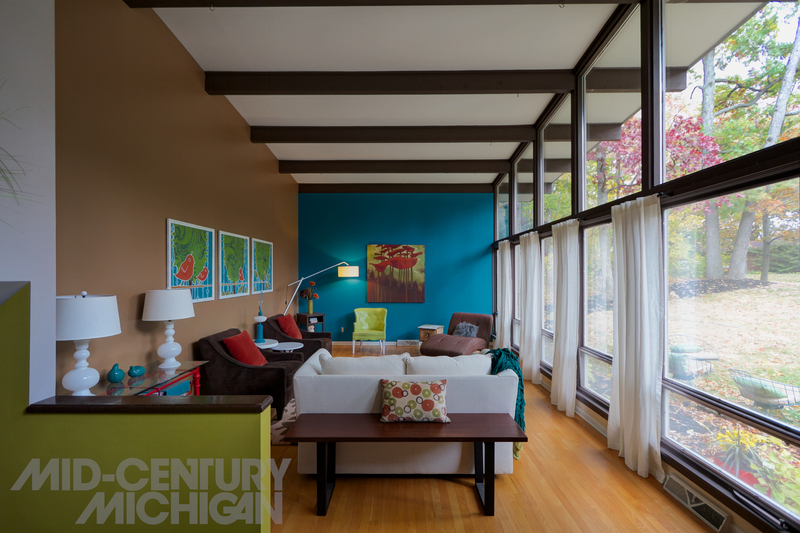 Photo courtesy of West Michigan Modern from the Betty Gibout Real Estate Collection, Grand Rapids Public Library. 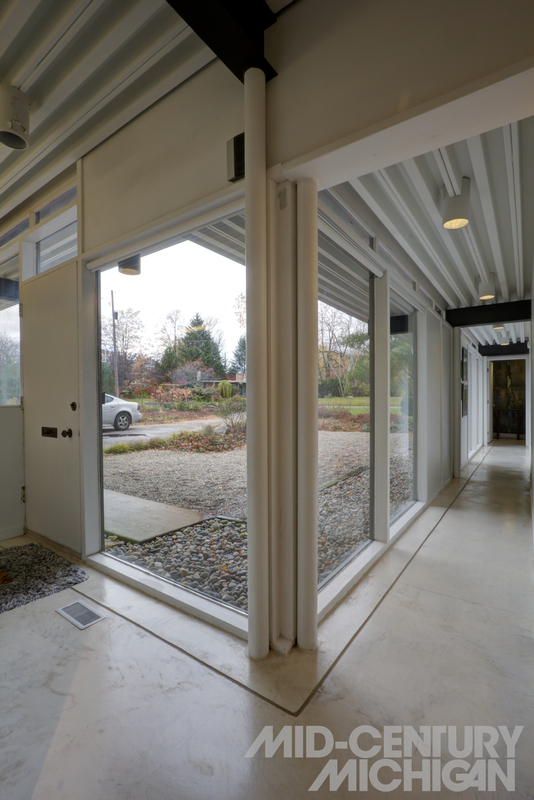 Today, this Chuck Carter house catches the eye with an ultra-modern form that somehow feels right for its neighborhood. It is a series of interlocking volumes, right angles, and mix of materials such as stacked stone, large expanses of glass, and vertical siding that give this home a decidedly retro-futuristic feel. 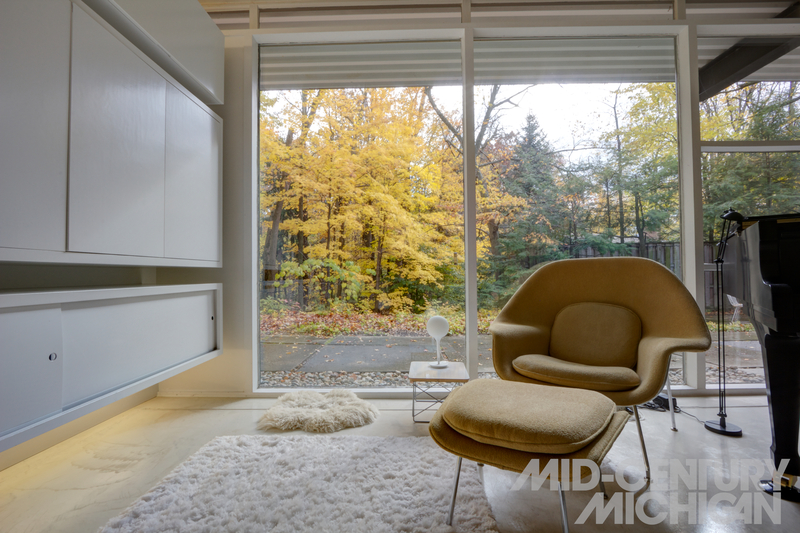 As attractive as it appears on the outside, it is every bit as stylish on the inside, lovingly curated by modernists, Tom and Vickie, who have called it home since 1986. The home sits far back from the street, greeting visitors with beautiful landscaping trailing up a gentle slope that leads to the covered entryway. 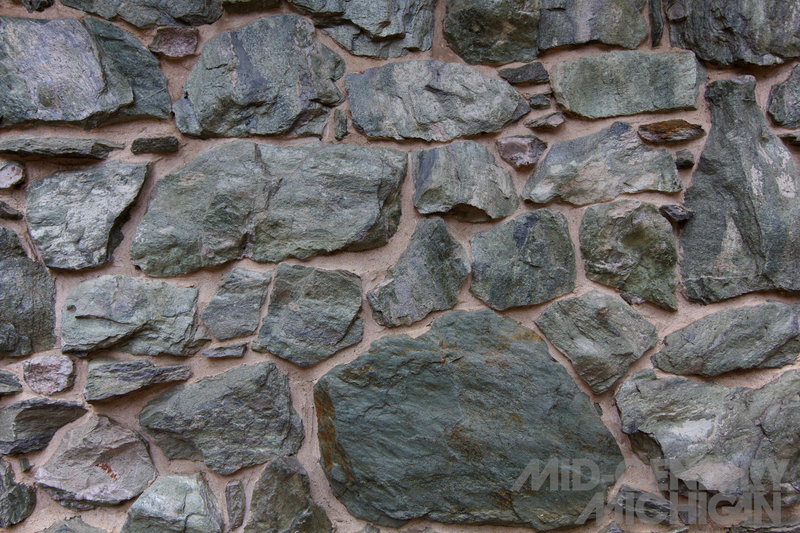 Here, a stacked stone wall leads to the front door, piercing the exterior and continuing inside of the house, where it divides the entry hall from the living room on the left. 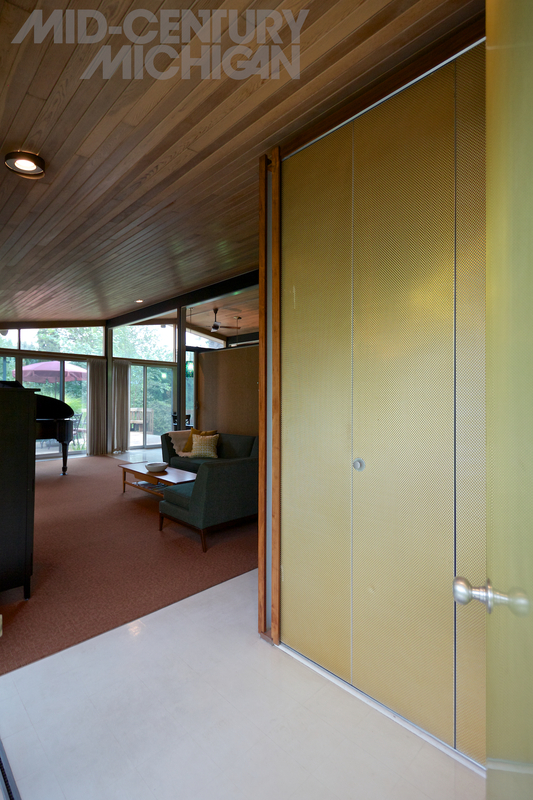 It does not, however, reach the ceiling, leaving an open, airy space between the two rooms. 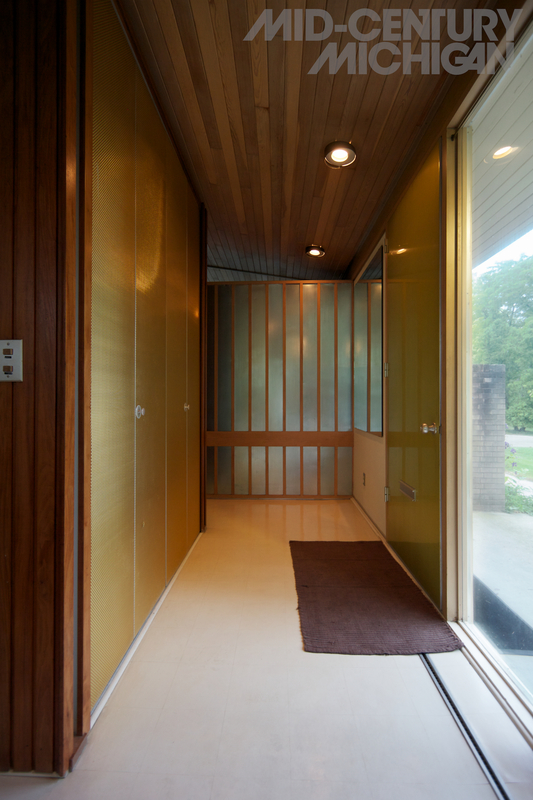 From this entry hall, it becomes apparent that the home is a cascade of three levels, allowing the occupants to look both down into the lower level, and into the open hallway upstairs at once. This junction occurs in the dining room of the house where the open space between the three levels is punctuated by the metal chimney of a freestanding matte black fireplace found downstairs. 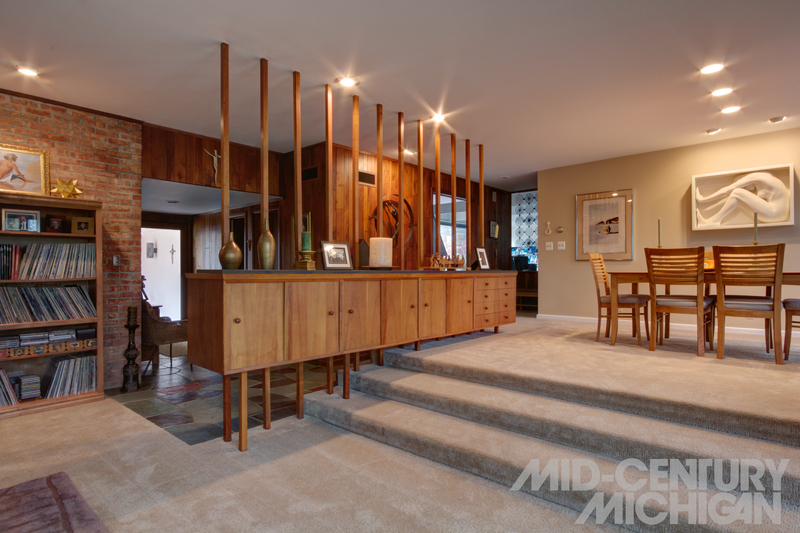 Two floating wooden staircases bridge the different heights, leading either up, or down, and are flanked by a thin metal railing — a 1960’s design element that Vickie asserts would never pass today’s safety codes. It is because of these three offset levels that the home takes on such a distinct shape from the exterior, with its dynamic volumes and varied rooflines. 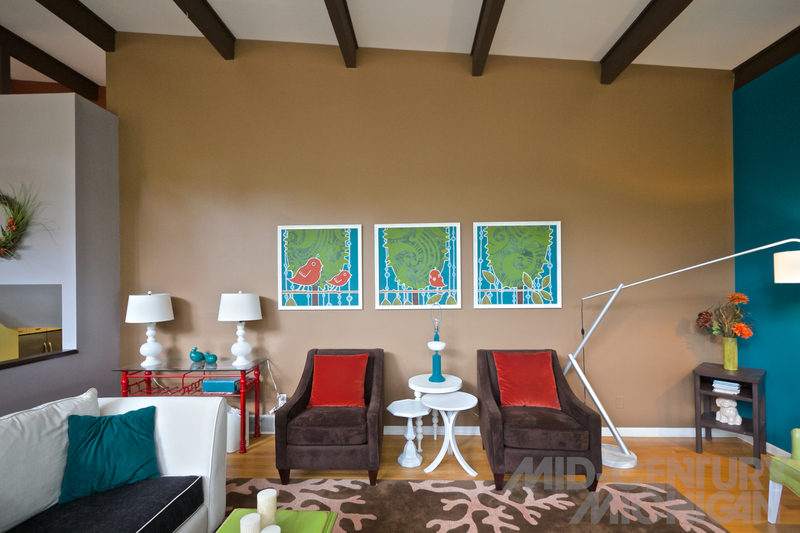 Judging by the choice of furniture and objects placed throughout the house, it is clear that Tom and Vickie have a serious eye for modernism and art. 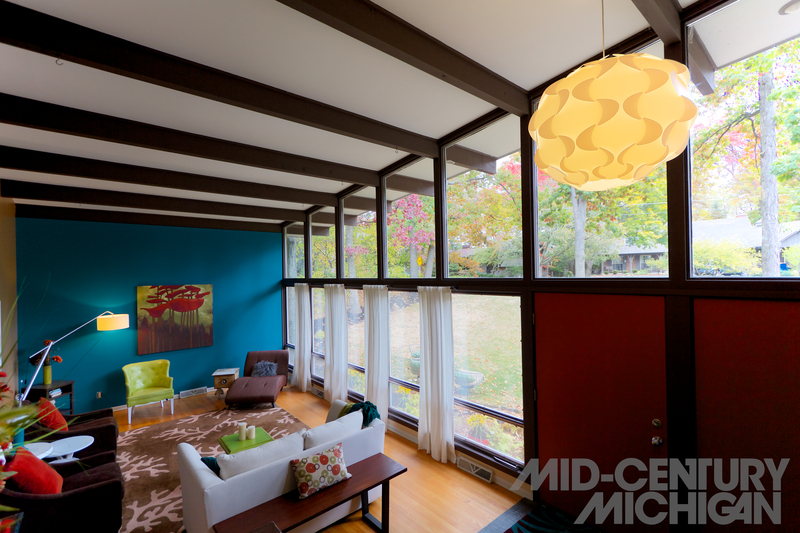 “You can tell by looking around that modernism has been in our blood since before we were married,” Vickie says. 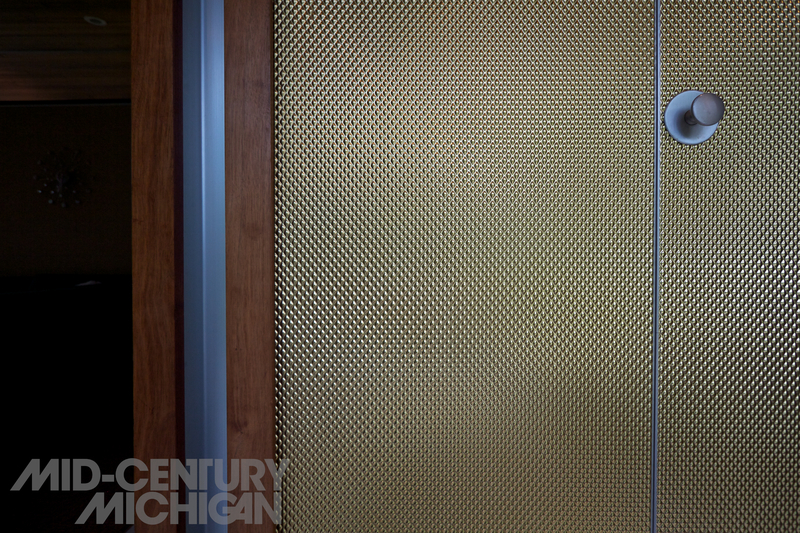 “I was in home economics at MSU, and some of the classes allowed us to visit Herman Miller in Zeeland. You can recognize the pieces,” she states, as she begins to point out the furniture by design icons George Nelson, Ray and Charles Eames, Isamu Noguchi, and more. “The only reason there isn’t a Herman Miller couch in our living room anymore is because now that we’re older and our friends are getting older, we need something we can get out of more easily,” she laughs. “The George Nelson Sling sofa that was once there is now downstairs” adds Tom. All throughout the house, items from Vickie’s extensive folk art collection can be found. Over the past several decades, their travels have allowed her to collect pieces from around the globe. Most of the collection lines the two George Nelson Comprehensive Storage System shelving both upstairs and in the lower level. Amongst her finds are many pieces by lesser-known folk artists, as well as original pieces by more notable outsider artists such as Howard Finster, who first came to widespread notice with his album artwork for R.E.M. and The Talking Heads. In two of the bedrooms hang an original signed print by Christo and Jeanne-Claude, and a hand-numbered Matisse lithograph. 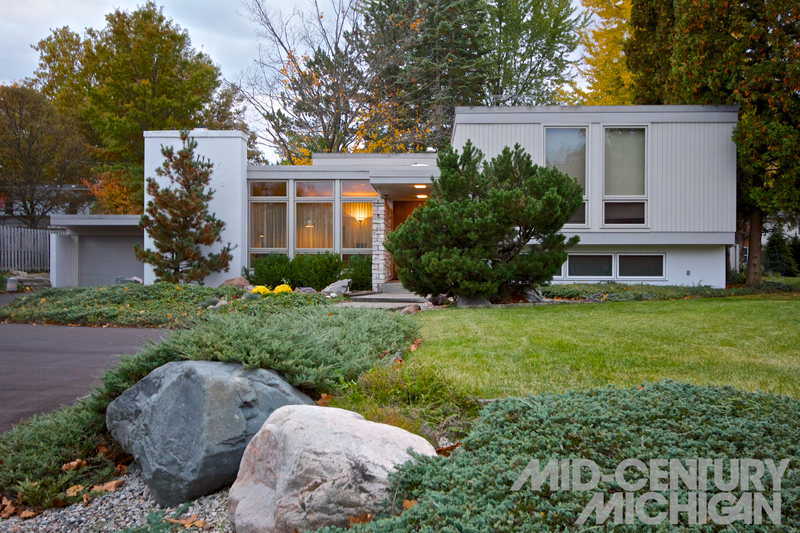 Prior to living here, Tom and Vickie owned a modern home in the Albert Builders development less than a mile away. As Tom recalls “We really enjoyed that house. Something I liked about it was that all the windows were in the corners. We lived there about fifteen years.” At that time, Vickie was in real estate. She explains, “We were friends with the prior owners of this home. They had lived directly across the street from here before the tornado, but were outgrowing their home, as they had three boys and the kids’ grandmother to look after. But several years later when it was time for them to sell, they asked me to list this house for them. We liked contemporary design and had been here to parties a lot, so at that point, I went home to Tom and asked, ‘What would you think about buying the house for ourselves?’ Our own boys were grown, so the timing seemed right.” “We just loved this house all along,” says Tom with a chuckle, beaming as he looks at his surroundings. Because the house was designed for a couple with three boys and a grandmother, a sense of pragmatism and function are noticeable in its layout. 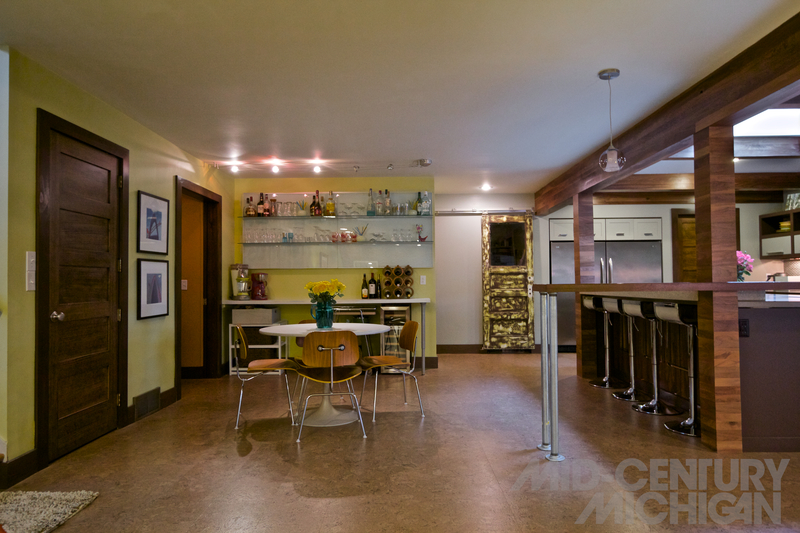 For example, the basement level is complete with its own living room, kitchenette, bathroom and sunken patio area with a private entrance, which would have served as an apartment for the grandmother. Today, it finds use as a complete guest suite. A card table in the basement folds into the built-in lighted shelving. Four skylights keep the home illuminated in a natural glow, and even allow for moonlight at night. 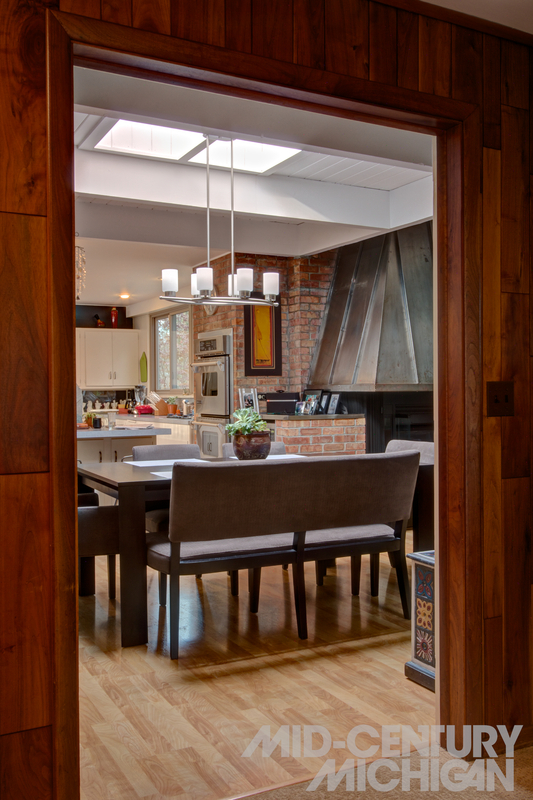 One of the skylights forms a light well that extends from the top level the downstairs bathroom, penetrating into the basement through a pane of frosted glass. All bedroom closets have cabinetry and drawers built in. “Chuck Carter did a lot of great things. I’ll tell you…architects have great ideas,” Vickie remarks. One of those great ideas was to increase the footprint of the house by adding foundation to the rear. This allowed for a new volume to be created, which serves as a storage area below, with a master bedroom above it. In the storage room lies a relic from the original home that was destroyed: a set of metal Geneva kitchen cabinets were salvaged from the wreckage and found their second life downstairs. Upstairs in the master bedroom, occupants can look out a wall of enormous glass sliders, and exit onto a railing-free balcony that overlooks a courtyard a short distance below. 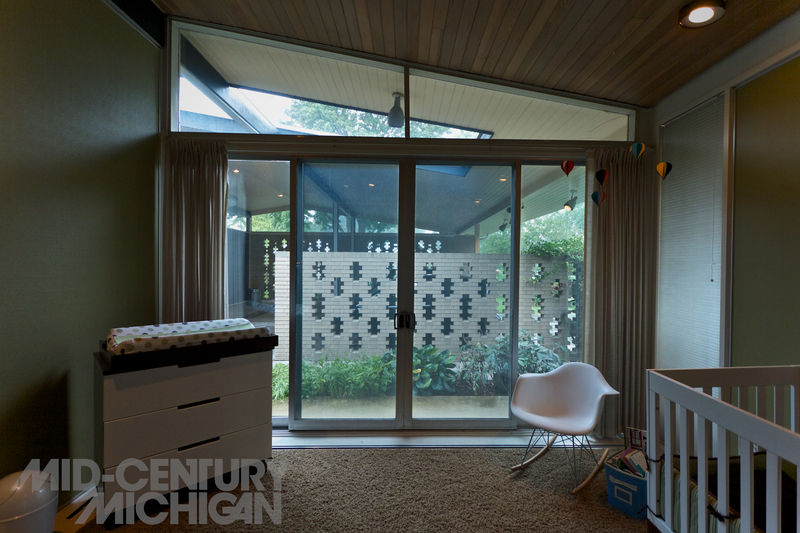 The other three bedrooms upstairs each have their own brightly colored doors, which share the same palette as the Herman Miller Company Picnic posters designed by Steve Frykholm, that hang nearby. 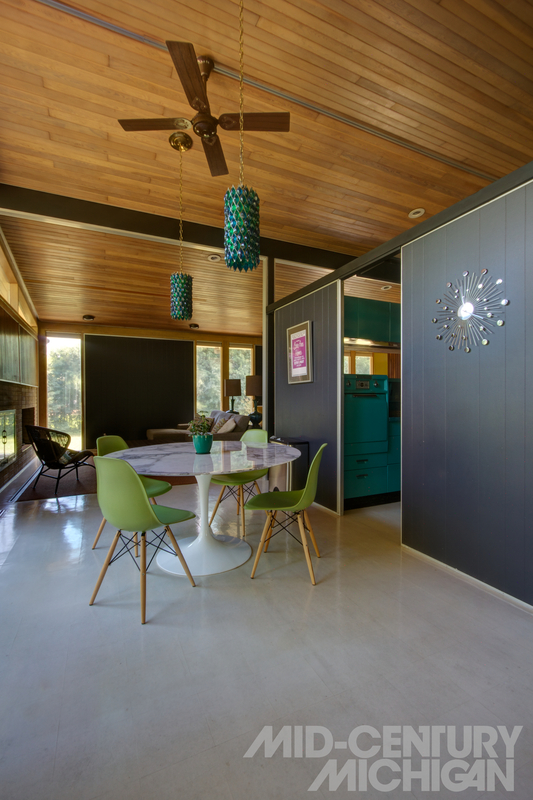 These extra rooms have found adaptive reuse as a home office, and guest bedrooms. 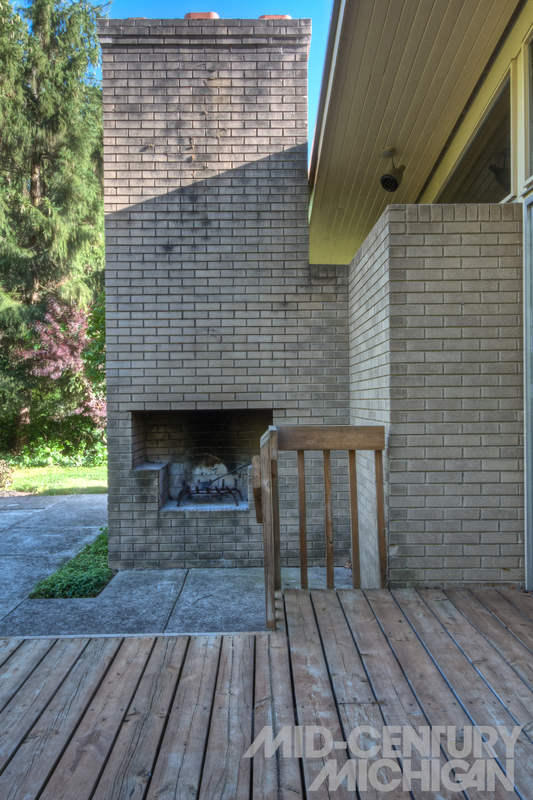 Many things about Tom and Vickie’s house seem frozen in 1967, yet impeccably preserved, and completely livable by today’s standards. 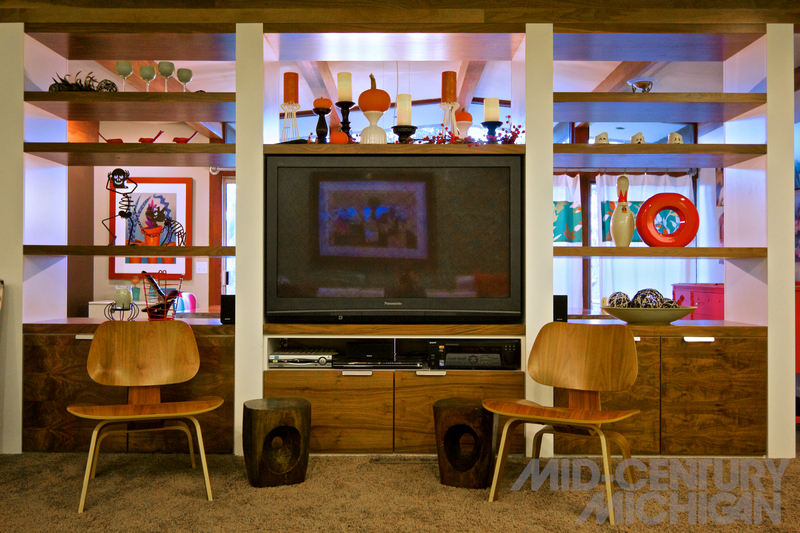 “We’ve built in some bookcases, but other than that, it’s pretty much original,” says Tom. The only major change that Tom and Vickie have introduced was an update to the kitchen. 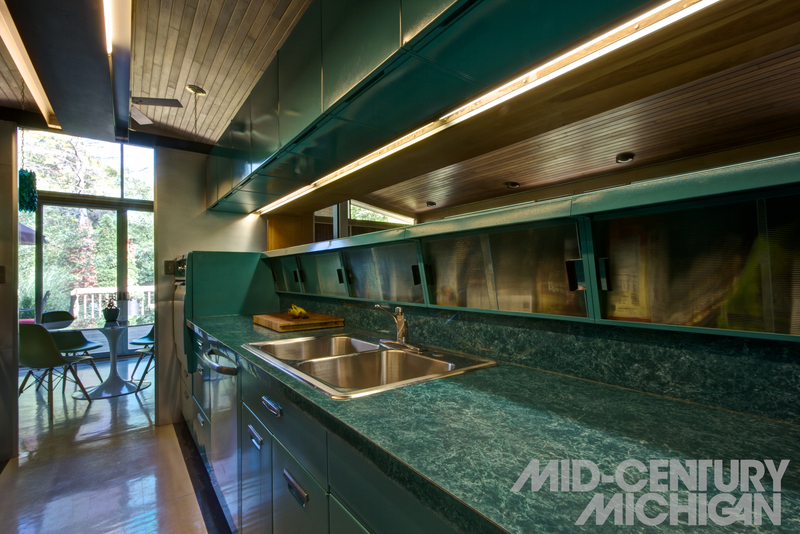 As it previously stood, retro features like wall ovens and a built-in countertop blender were once part of its “modern” amenities. Their remodel was sympathetic, however, where they matched cabinetry to what already existed, and chose simple forms and elegant materials. “All of our neighbors around here have a strong sense of community and many of them are interested in modern architecture,” Tom concludes. 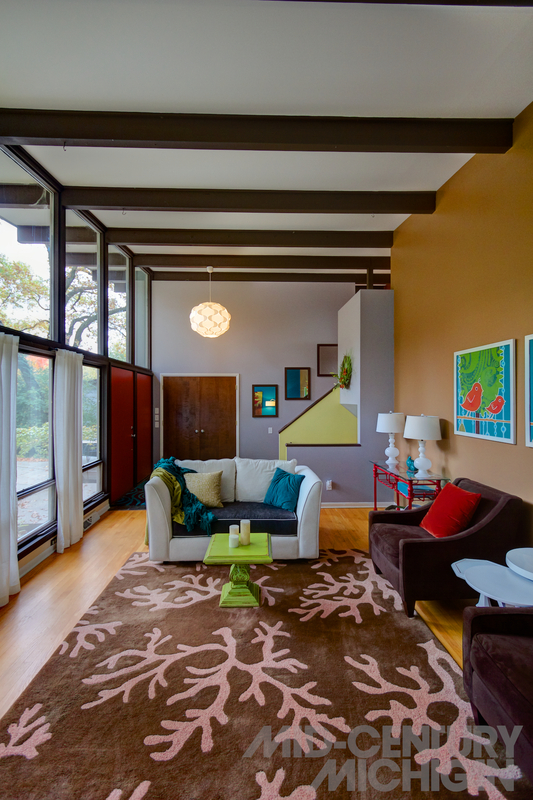 Despite the lack of historic preservation ordinances in their neighborhood, it is because of owners like Tom and Vickie that gems like their own home color the neighborhood with their exquisite, unadulterated forms. But their house is extra special amongst the rest, carrying with it a story of creation and transformation, where out of rubble, a beautiful work of balance and form arose. 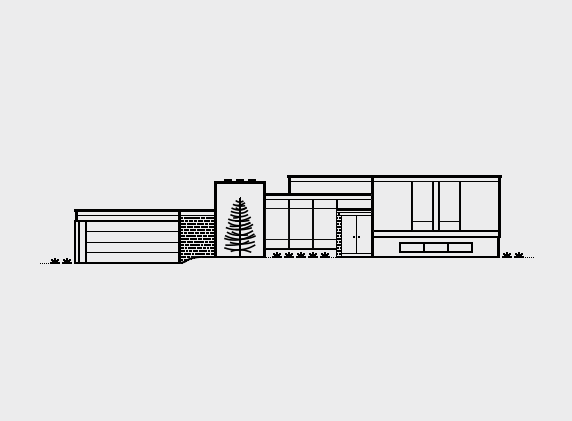 A special thanks to <a href=”https://www.behance.net/gallery/19232419/Midcentury-Modern-Homes-Collection”>Michael Nÿkamp of MKN Design</a> for the Illustration, and to Pamela Vander Ploeg of <a href=”http://westmichiganmodern.com”>West Michigan Modern</a> for the black and white photo of the Wayne McClure home that once stood in place. The Wayne McClure home as it stood before being razed by a tornado. 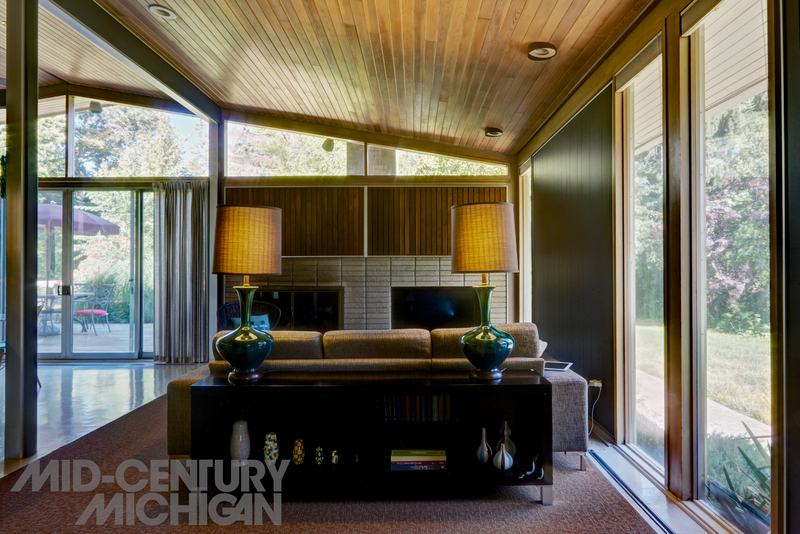 Photo courtesy of West Michigan Modern from the Betty Gibout Real Estate Collection, Grand Rapids Public Library. Built into the slope of a hill and completely glassed in on the entry level, Mindi and Kevin’s house is a standout on their block. A mixture of stacked slate, vertical wood siding, and a sloping post-and-beam roofline define the look of an era. 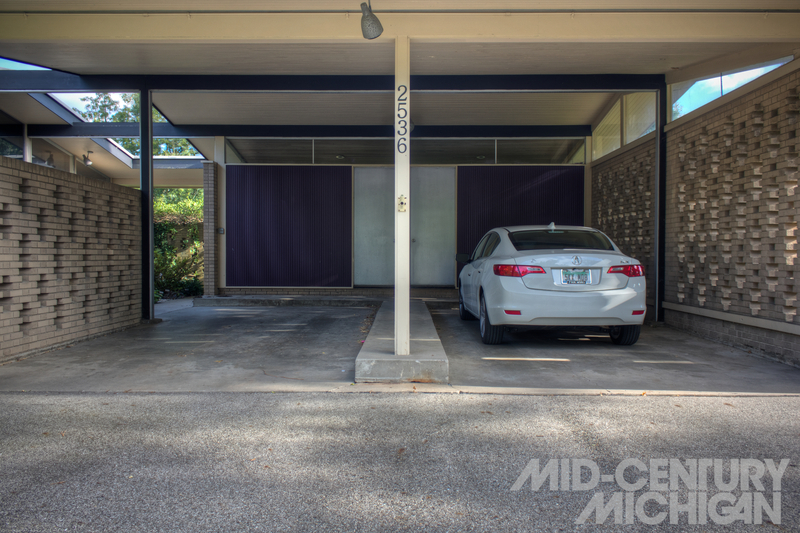 From the street view, this house seems like a perfectly preserved time capsule of the atomic era. Step through the large red front door, however, and fast forward to present day, where Kevin and Mindi are raising their three kids in an ever-evolving atmosphere of energy and color. 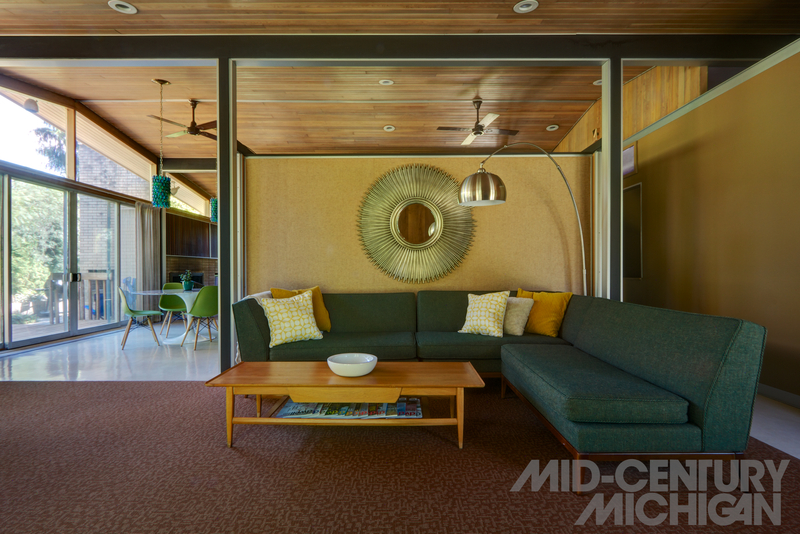 Kevin and Mindi’s home was built around 1964, and is part of a collection of homes in their neighborhood that were constructed by Albert Builders. 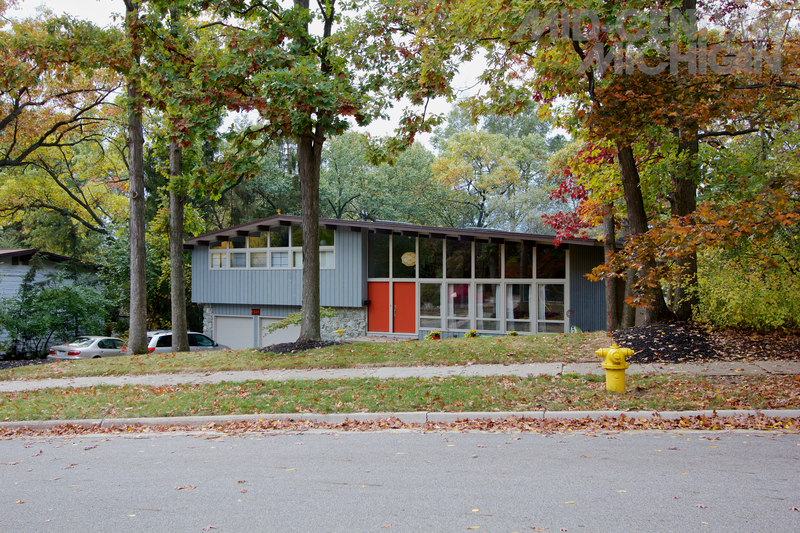 Their home, the “Kendalwood,” as named on its architectural drawings, is one of hundreds of Albert Builders’ homes in Grand Rapids, many of which are sprinkled throughout Kevin and Mindi’s neighborhood, and easily identified by their modern lines and appealing use of glass, wood, stone, and brick. Silas (Sy) Albert, who founded Albert Builders, began developing neighborhoods during a housing shortage when many GI’s were returning home from World War II. 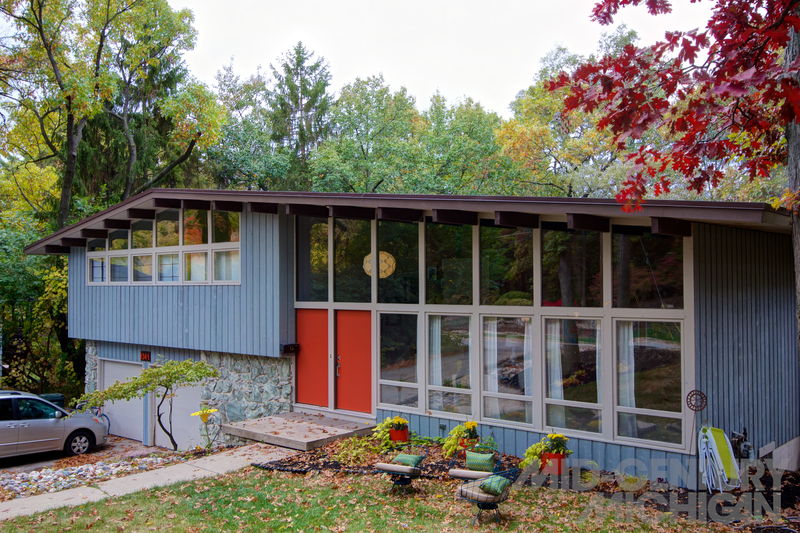 Though the “Kendalwood” isn’t specifically attributed to them, Albert Builders frequently employed the skills of local architects, O’Bryen and Knapp, whose names adorn many of the architectural drawings of the homes they built, essentially bringing quality, architect-designed modern homes to the masses during the mid-century development boom. Courtesy of Grand Rapids History & Special Collections, Archives, Grand Rapids Public Library, Grand Rapids, Mi. Mindi admits she cannot leave anything around her untouched, and the Kendalwood is her creative playground. 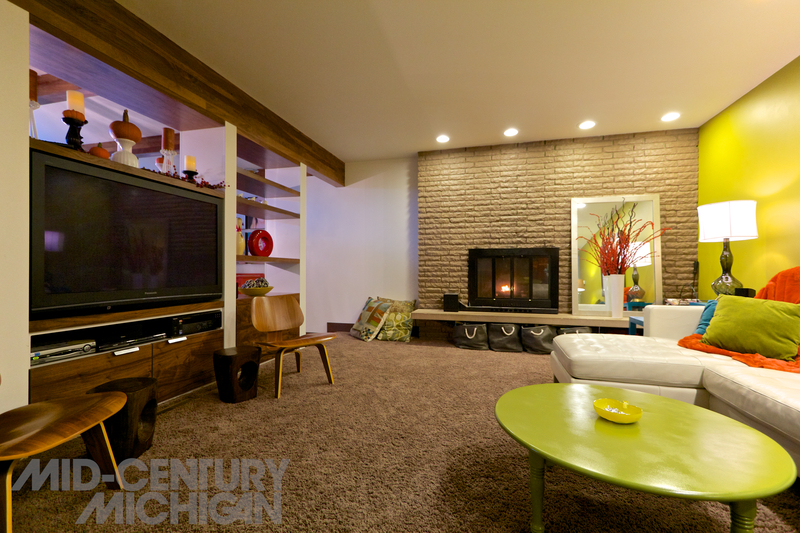 Since Kevin and Mindi moved in in 2009, their house has been in a constant state of change. 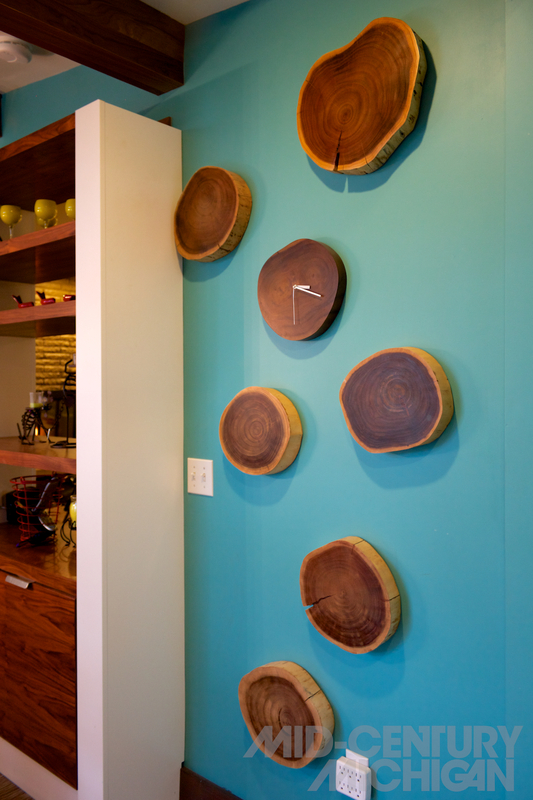 “The whole house is a DIY project, and it needed a lot of work” says Mindi, who herself, is an interior decorator. Though she doesn’t recall exactly what triggered her enthusiasm for mid-century modern architecture (her background in English certainly didn’t do it,) perhaps it was the years spent working at an art gallery, where she cultivated a refined sensitivity to art and design. 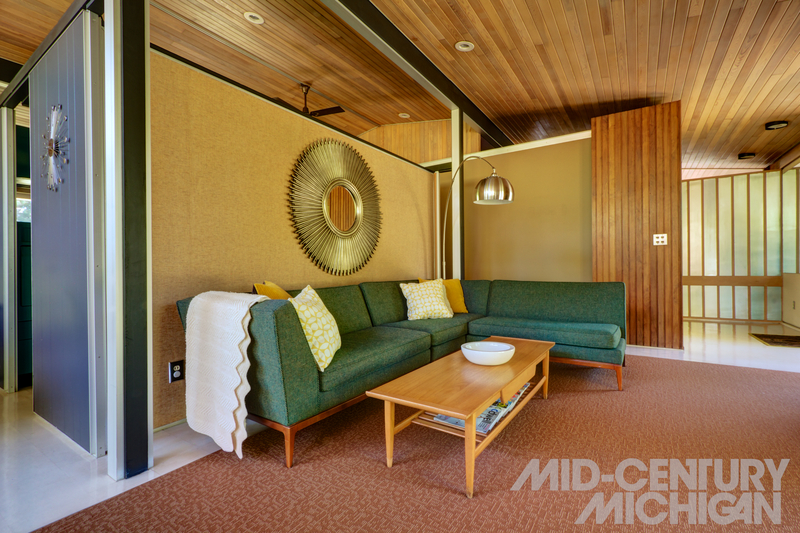 “When we started looking for houses, my husband, Kevin got sucked into the appeal of mid-century modern, so our search just branched out from there. Though not immediately apparent from the street view, their house has five levels. 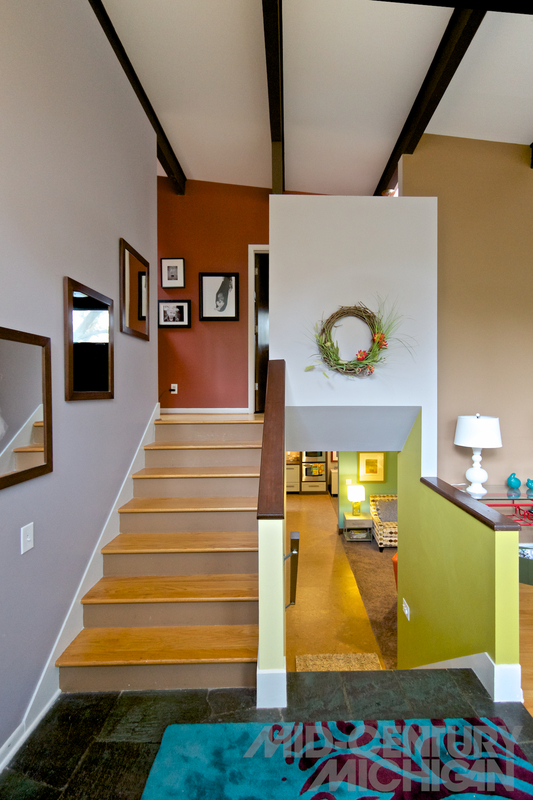 In the main entryway, a bi-level staircase leads to both upstairs, where the bedrooms are located, and downstairs, where a family room, dining room, and kitchen are found. Also on the entry level is a formal living room on the right. From the lower level, stairs lead down yet another half-level before descending to the basement. Being built into the hill, there is walkout access on the lower level in the dining room. “When we moved in, the lower level was very dark and closed off,” recalls Mindi. 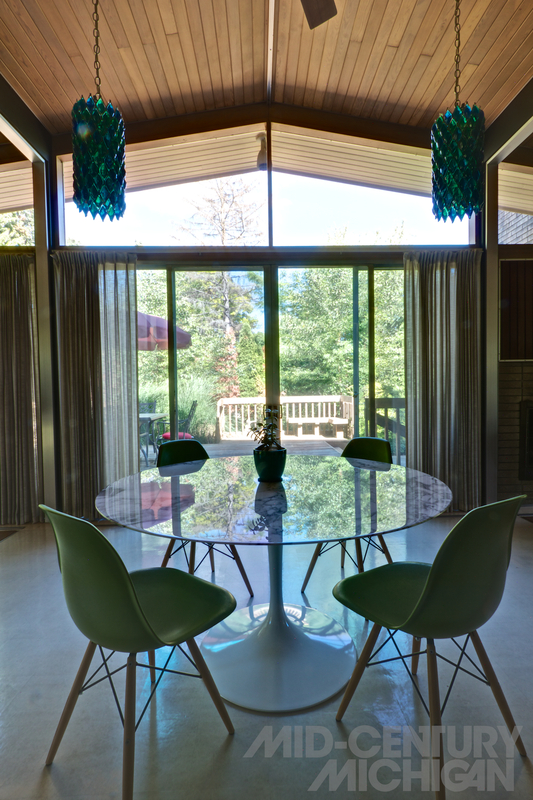 “We wanted to open it up more and use the natural daylight, because we knew we’d be spending most of our time down here.” Daylight now streams through a large skylight over the kitchen island, and bank of sliding glass doors in the dining room. 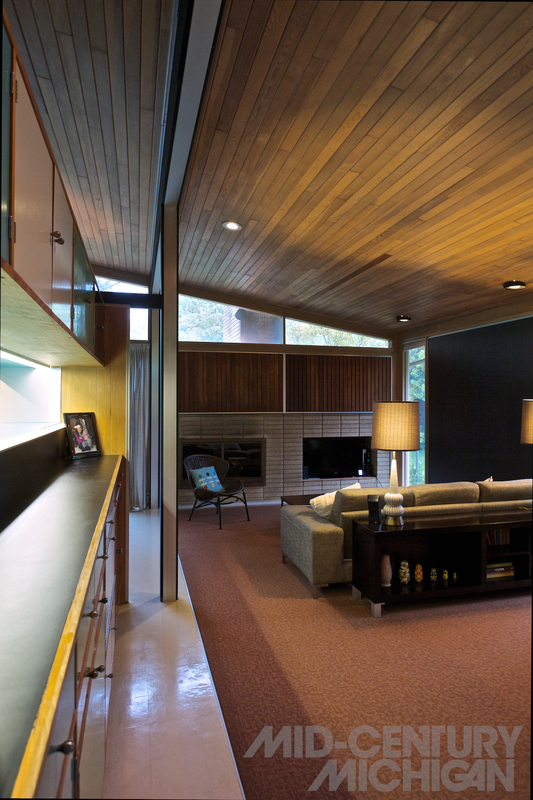 A pass-through between the dining and living area lets daylight permeate even further into the house. 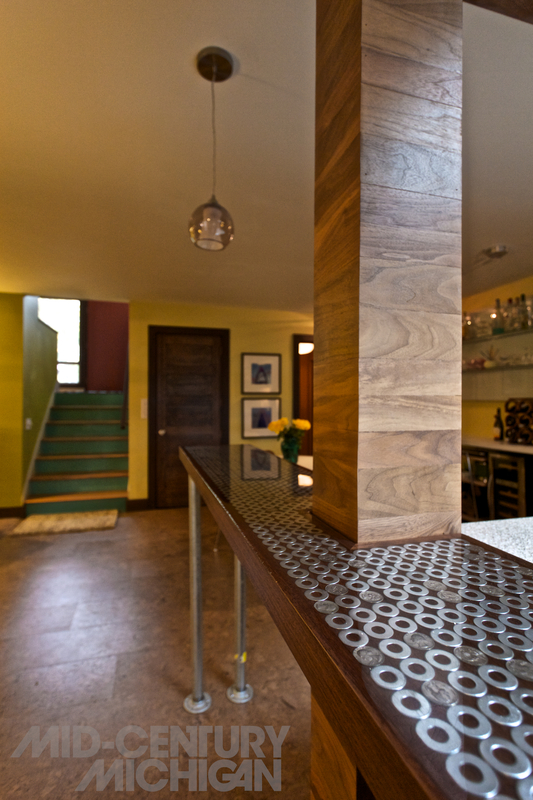 Where walls were taken down during the remodel, support beams were left in place, but covered in a handsome walnut veneer. The end result is a completely open floor plan on the lower level, with spaces neatly defined by use of materials and furnishings. 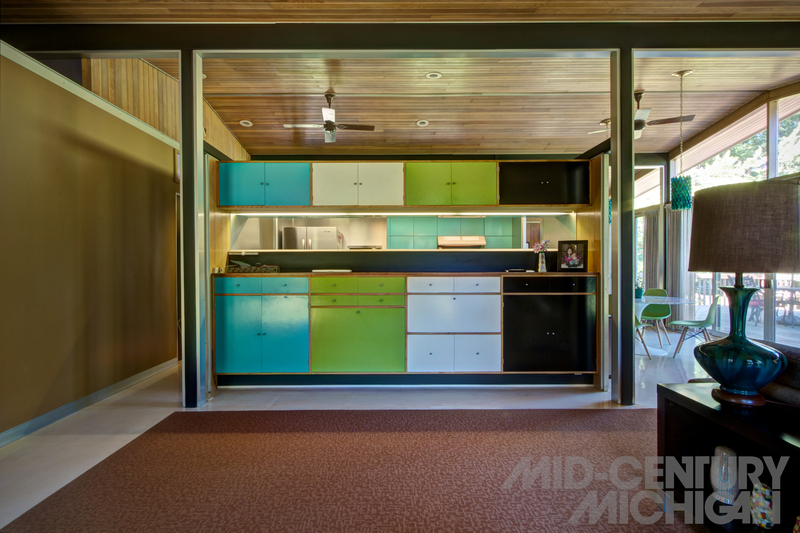 Wherever possible, salvaged items were used throughout the house during its transformation. 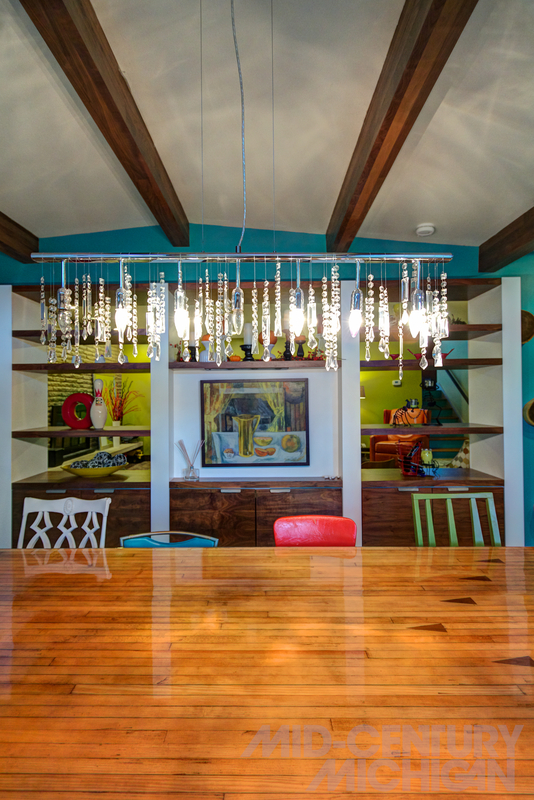 Made of the remains of a bowling alley lane, the dining room table, for example, was a reassembled craigslist find, and is flanked by a playful collection of colorful mix-and-match chairs. 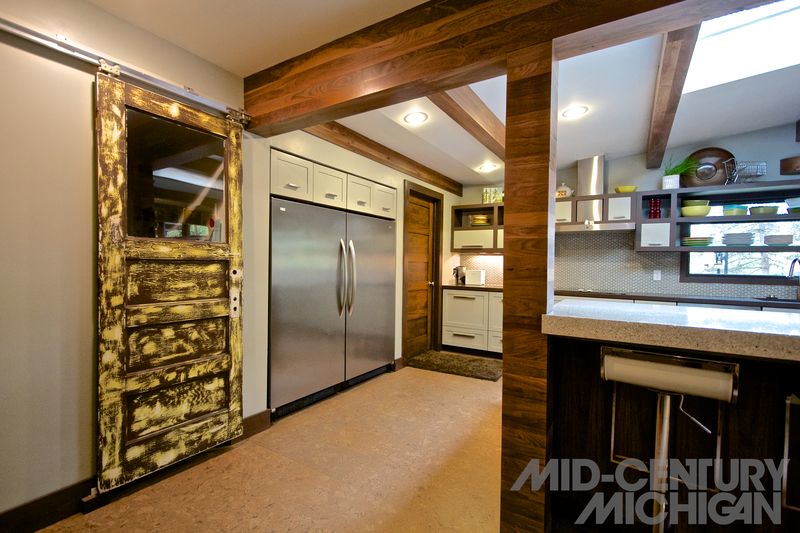 The industrial metal sliding door for the pantry was also found via Craigslist. 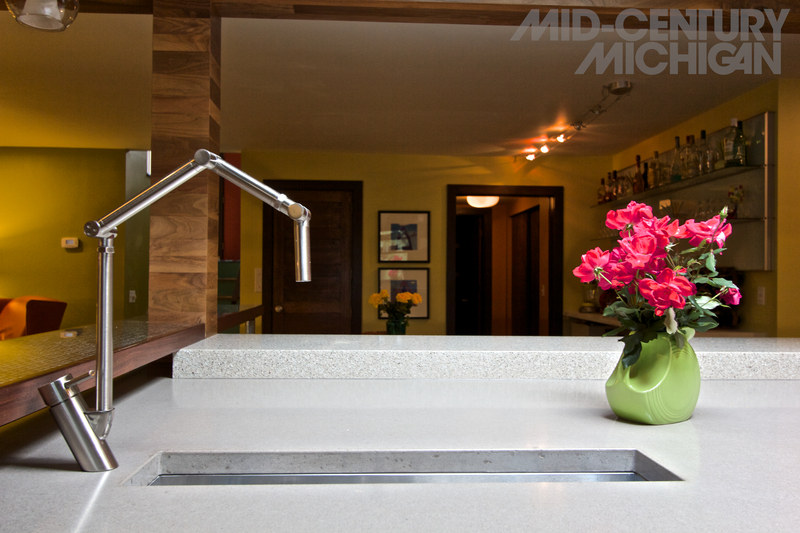 In the kitchen, metal washers and quarters embedded under epoxy create a shimmering bar countertop, which Mindi designed herself. Classic Herman Miller furniture, where present, is mostly second-hand. 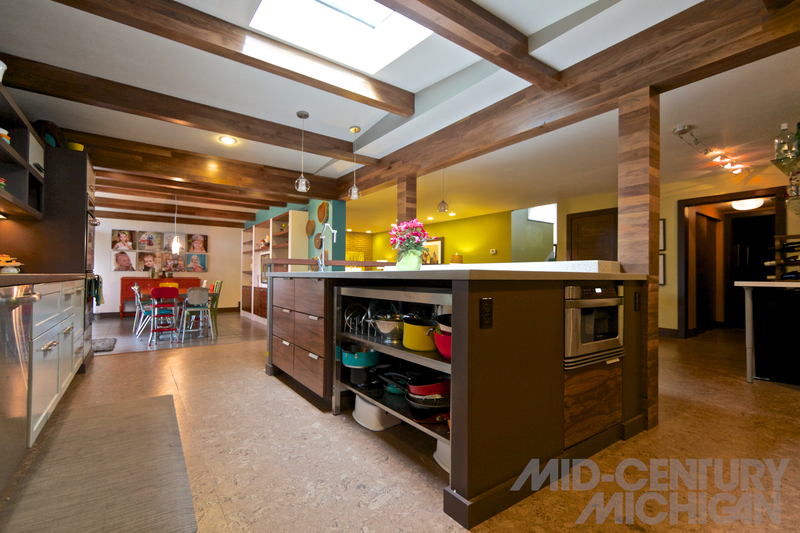 Mindi’s relentless quest to improve and cultivate her family’s space shows in the home’s personality and charm. The amount of love the home has been given by the couple is apparent. 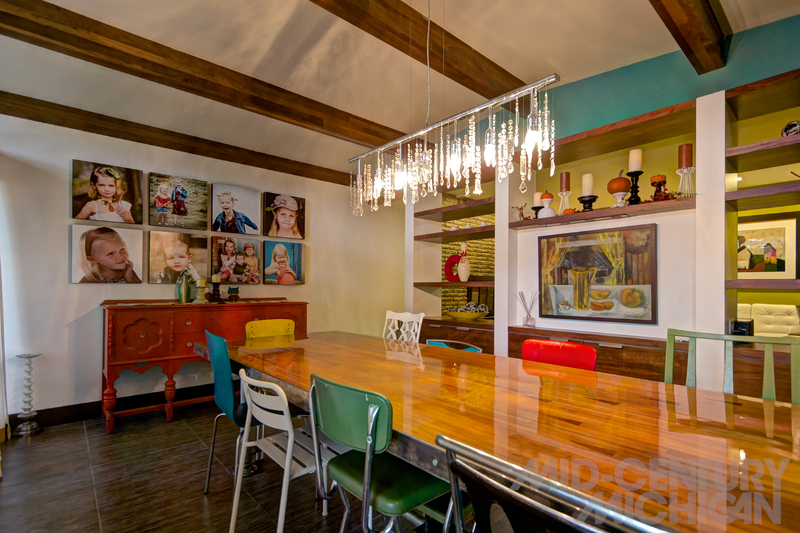 Its vibrant pop-art color accents serve as an offbeat accompaniment to the home’s mid-1960’s origins. “I would love to have nothing but designer furniture in here, but with three kids under ten, that’s not happening right now,” Mindi quips. 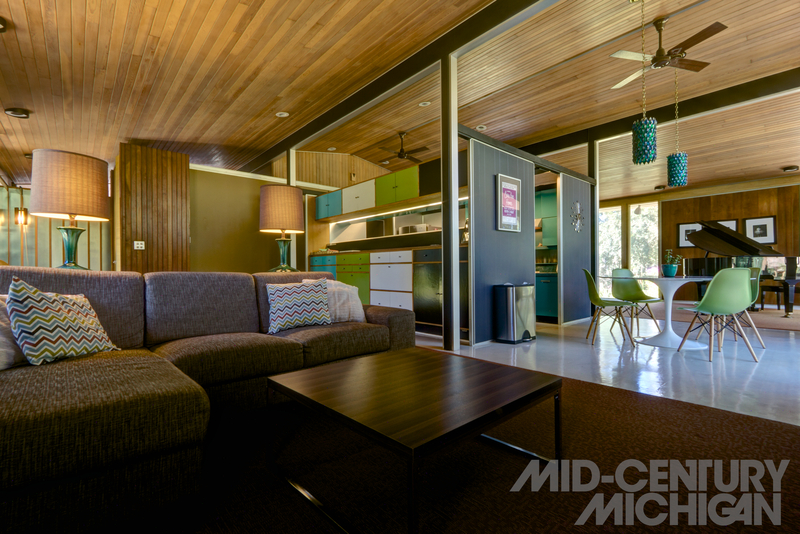 But given time and effort, Mindi and Kevin’s home becomes more and more of a familial self-portrait of modern day life mid-century modern home. Interested in Mindi’s Interior decorating services? Click here to learn more. An extra special thank-you goes to the Grand Rapids Public Library for the original drawing of the Kendalwood. 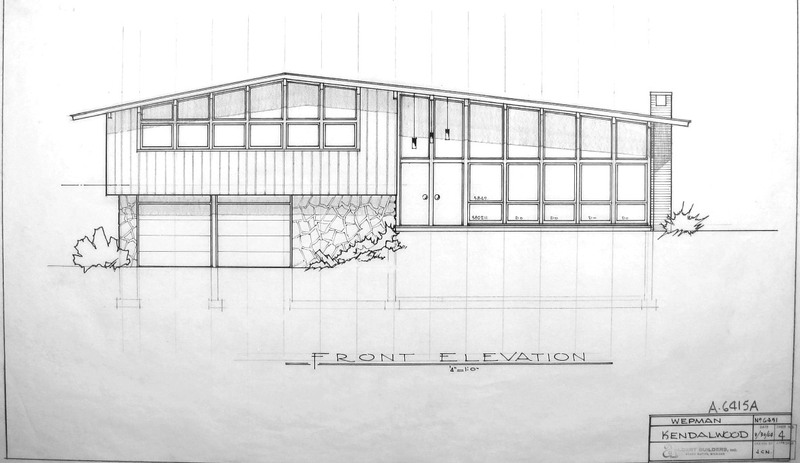 The Albert Builders Collection at the library primarily consists of architectural drawings of single-family homes designed between the mid-1950s and 1960s, and can be viewed online. The images in the collection are mostly front-elevation drawings; additional details and drawings can be accessed on-site from the archives. 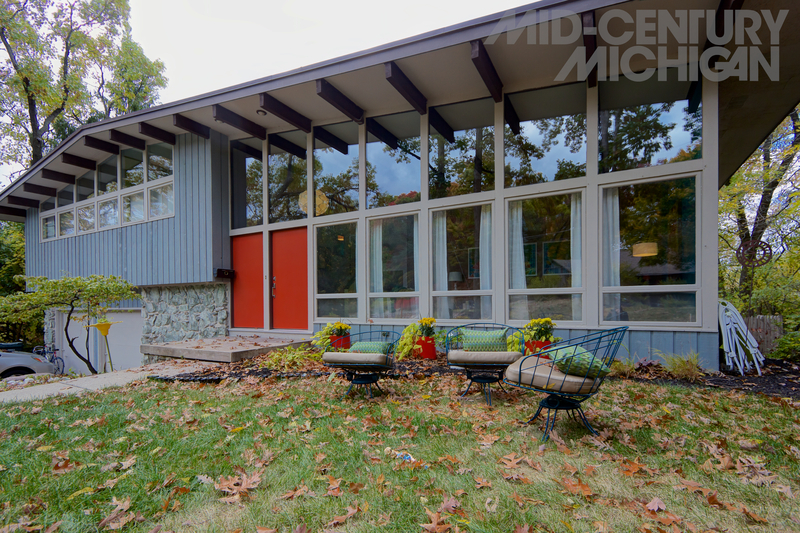 In 1957, Grand Rapids, Michigan was introduced to the work of prominent modern architect, Charles Goodman with the Alcoa Care Free home. Intended as a showcase piece for the Aluminum Company of America, the Alcoa Care Free home was a collaborative project exploring new uses of aluminum in home building, through what Alcoa dubbed in their sales brochure as the “greatest change in residential building materials in centuries.” Though the exact number is disputed, around 27 Alcoa Care Free Homes were built around the country and opened to the public for a six-week showing period. 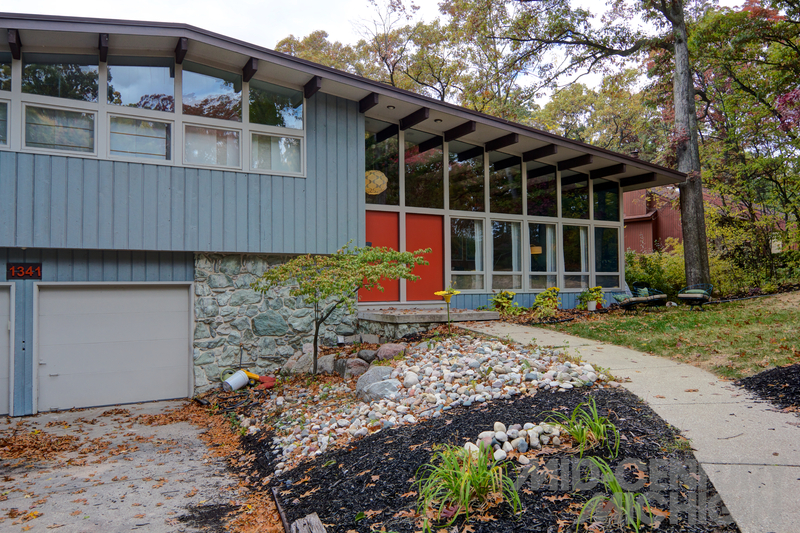 The intent was to promote Alcoa’s then new “Residential Building Products Sales Division.” Out of the examples remaining today, Jon and Lissa state their Care Free Home in Grand Rapids may be one of the best preserved. Jon and Lissa, both advertising executives, have lived in their Alcoa Care Free Home since December 2011 along with their two small children, Quinn and Enzo. For the young couple, it was love at first sight. “I remember calling the agent to see it, though I wasn’t really sure if we’d want to buy it. But when we saw the house, we fell in love with it,” Lissa says. “We knew we absolutely had to have the house,” adds Jon. 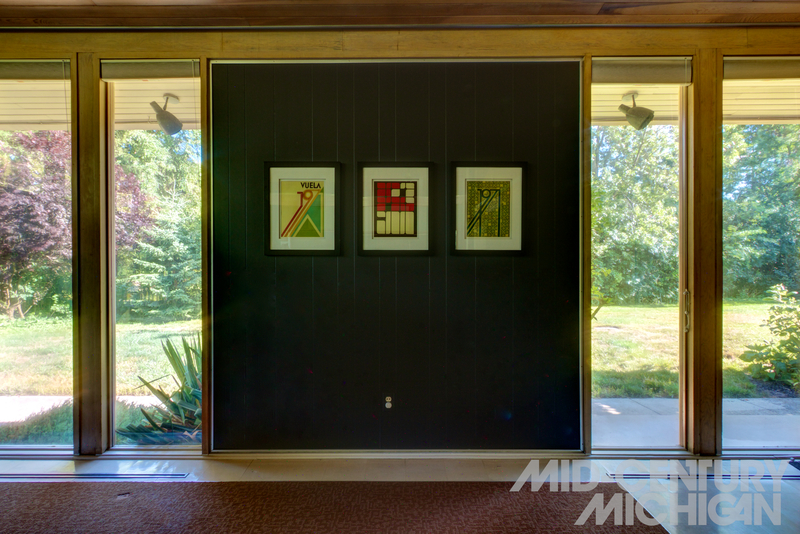 With a symmetrical layout, the Alcoa Care Free Home is a classic mid-century modern ranch, with large expanses of floor-to-ceiling glass capping off either end of its peaked structure. 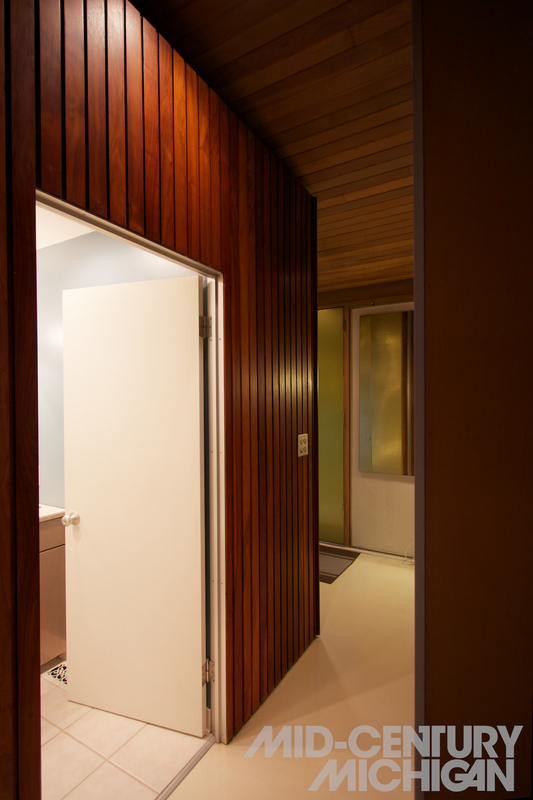 A soaring, vaulted roof clad in cypress creates a sense of vastness for the 1,900 square foot main floor, where walls of tongue-in-groove teak add a sense of warmth and enclosure to the space. 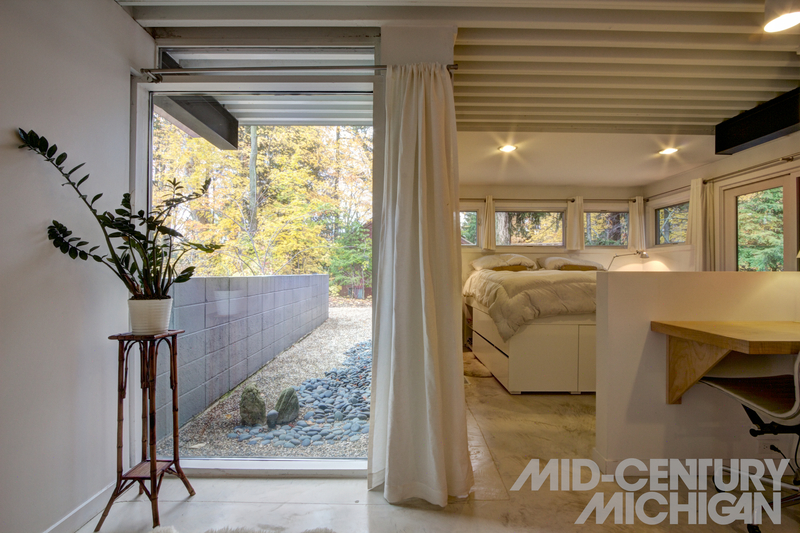 Interior clerestory windows between the bedrooms and entryways achieve what Goodman described as an “atmosphere of Space.” (Exciting new ways to build with aluminum. Better Homes and Gardens, October 1957.) 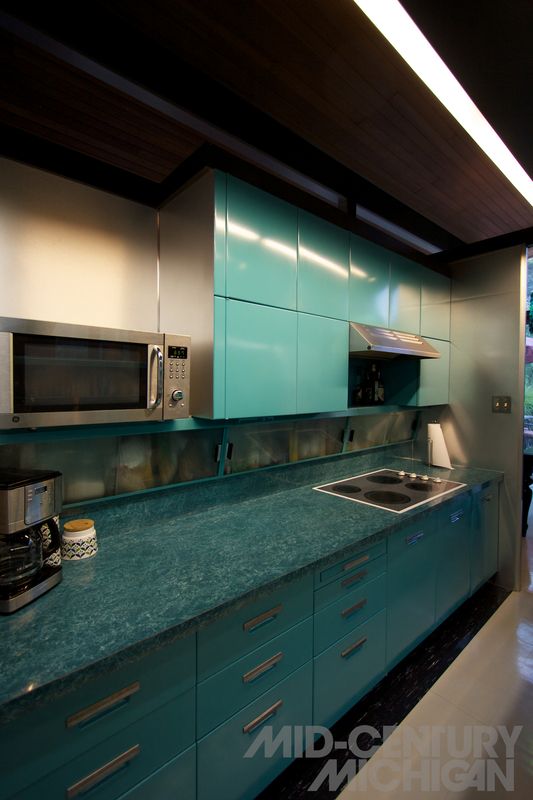 Throughout the home Goodman chose a playful jewel tone palette of purple, teal, green and gold. 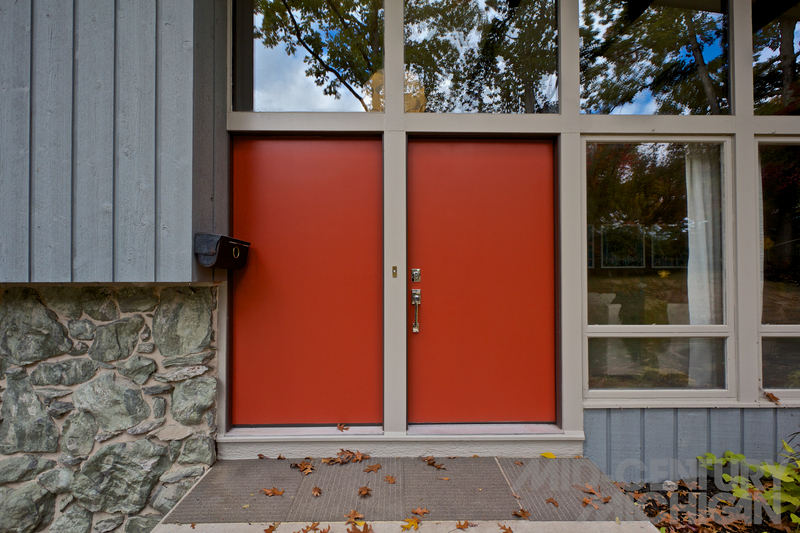 These colorful finishes are found in cabinetry, doors, paneling, and fixtures. 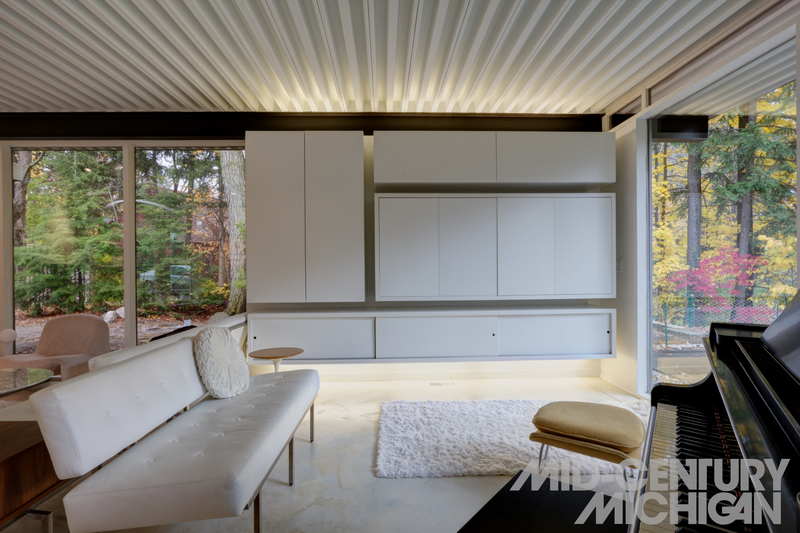 Exposed aluminum components are both colorfully anodized and bare metallic, adding a dazzling glint to the interior. As a testament to their home’s authentic, unaltered condition, Jon admits, “We haven’t done a thing yet, honestly, except for painting two of the bedrooms. We have copies of the original brochures, which we’ve inherited with the house.” Using the brochure as a rough blueprint for their interior design ethos, Jon and Lissa have made use of the space as Goodman intended. 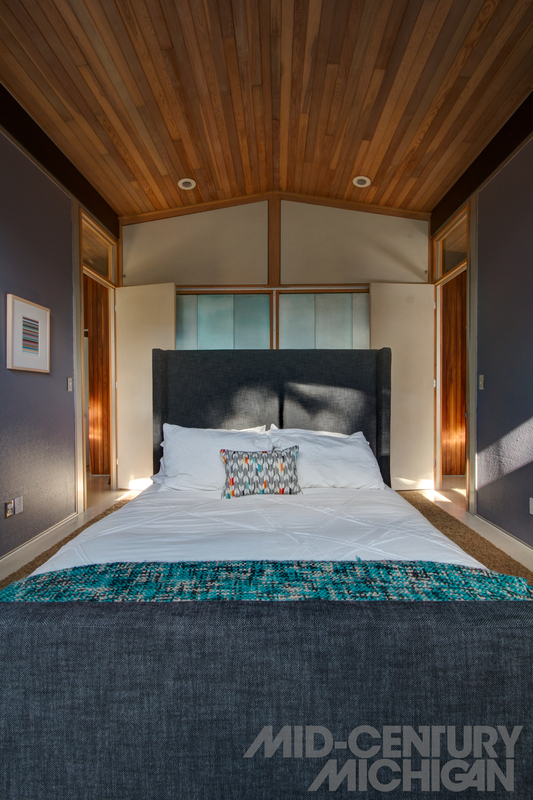 For example, the couple’s bed is freestanding within their room because “this is how they had it in the brochure,” says Jon. 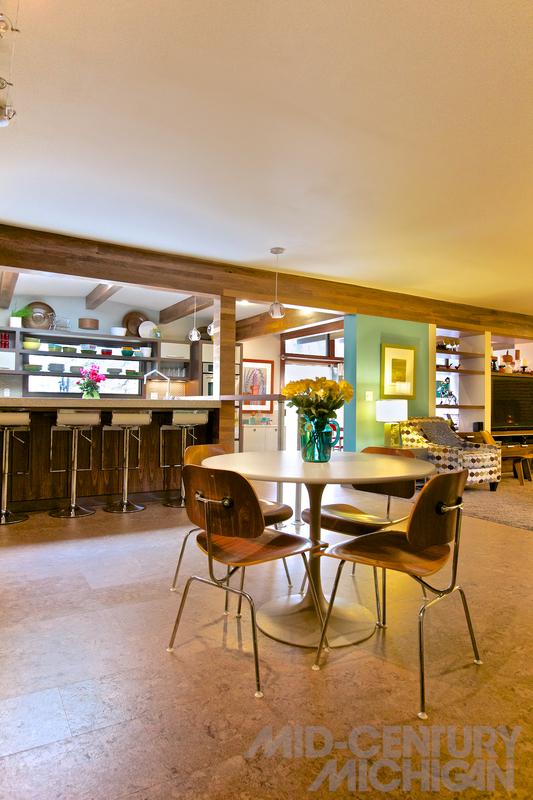 The “family room” adjacent to the kitchen has not only a cozy place to lounge by the fire, but also leaves a large plot of open floor for the kids to play, just like in the brochure. “There is no furniture here, because it is usually just littered with toys,” adds Lissa. 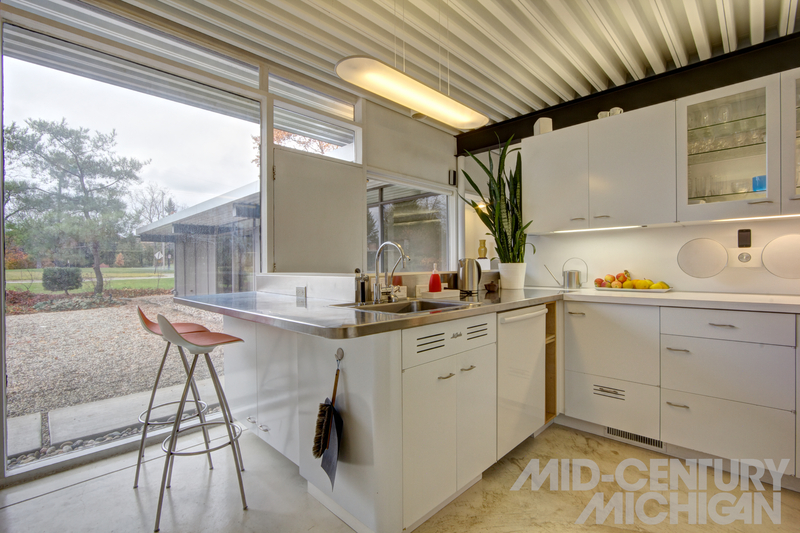 Despite the Alcoa Care Free home being a mass-produced icon, every example had its own features, as each of the builders took a bit of liberty with the design. Their particular home, for example, has three fireplaces, (one in the living room, one on the patio, and one in the basement,) whereas some models have none. 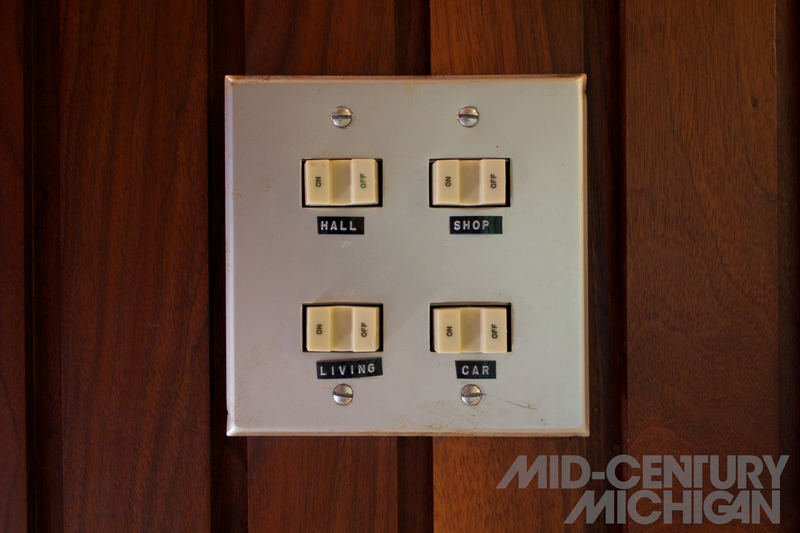 Their home also has air conditioning, which the house came equipped with. 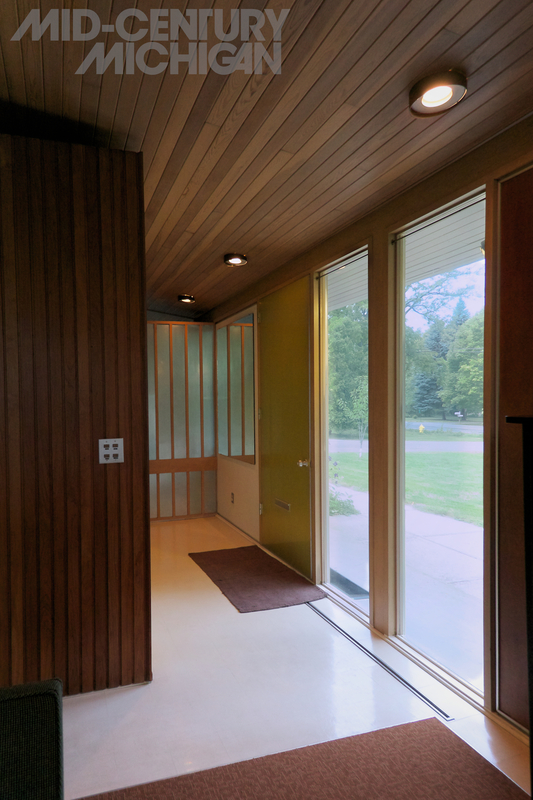 Whereas most Alcoa Care Free homes have a kitchen that backs up against a wall in the house Jon and Lissa’s is a freestanding room centered in the home, with stairs to the basement in the adjacent wall. 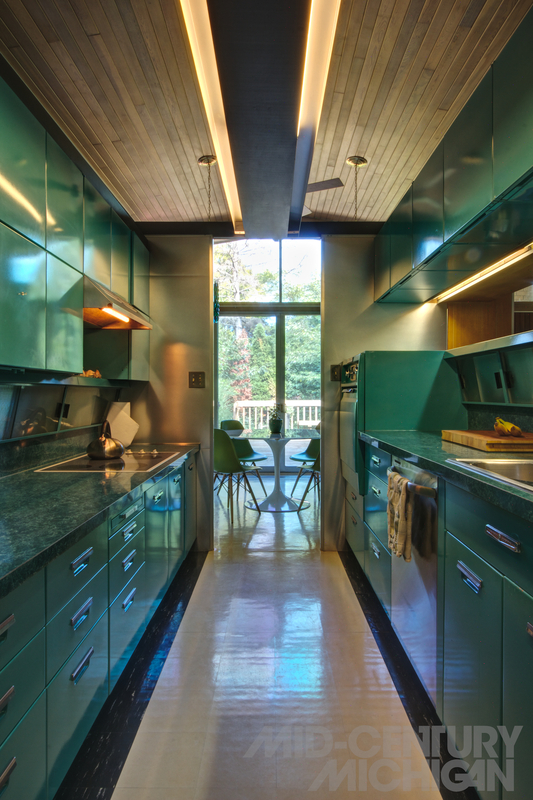 The kitchen, perhaps one of the most memorable rooms in the house, is a turquoise green galley that divides the living area of the home down the middle. 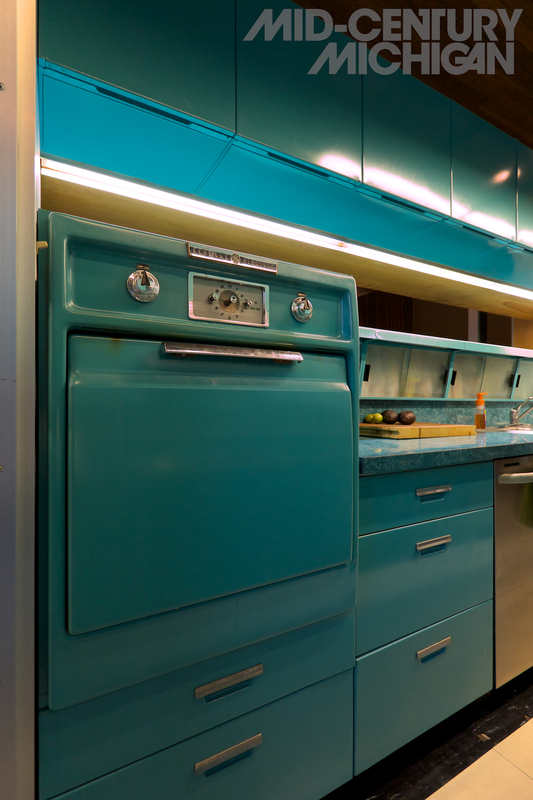 A well-preserved example of the GE Wonder Kitchen, its modular metal structure features matching oven, drawers, cabinets, and “cabinettes,” compact storage units with tilted glass sliders, mounted just above counter height. 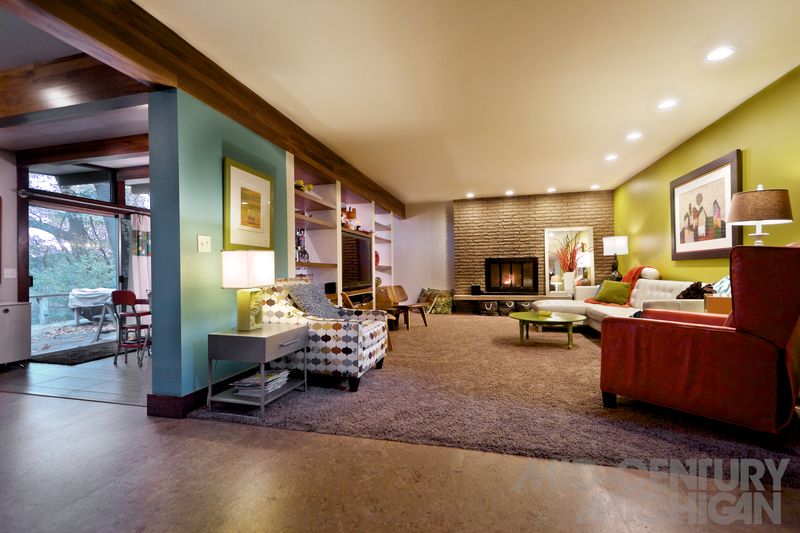 A pass-through on the family room side allows for supervision of the children’s play area. 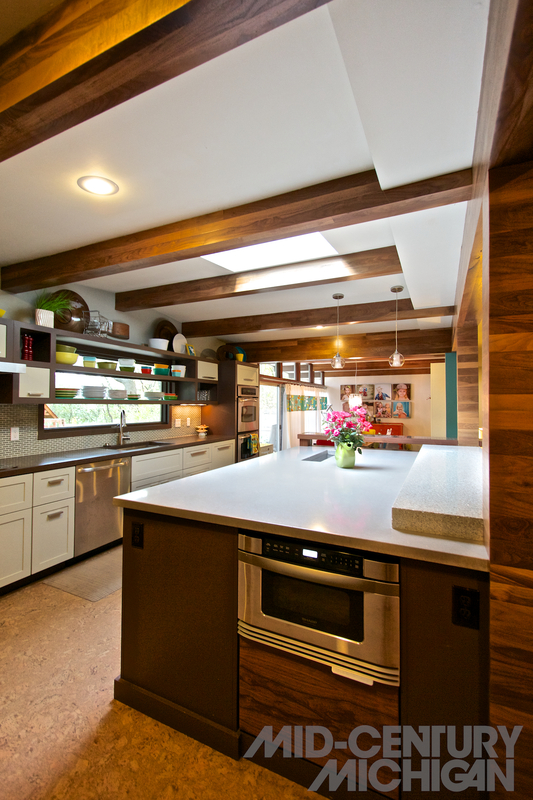 Overhead, a row of lighting keeps the kitchen bright, while the vaulted wooden ceiling soars above. Because of the scarce nature of their home and its specific parts and finishes, Jon and Lissa have concerns about the challenge of preserving such a special house. To them, it is much like owning a vintage automobile, of which only a handful were built. 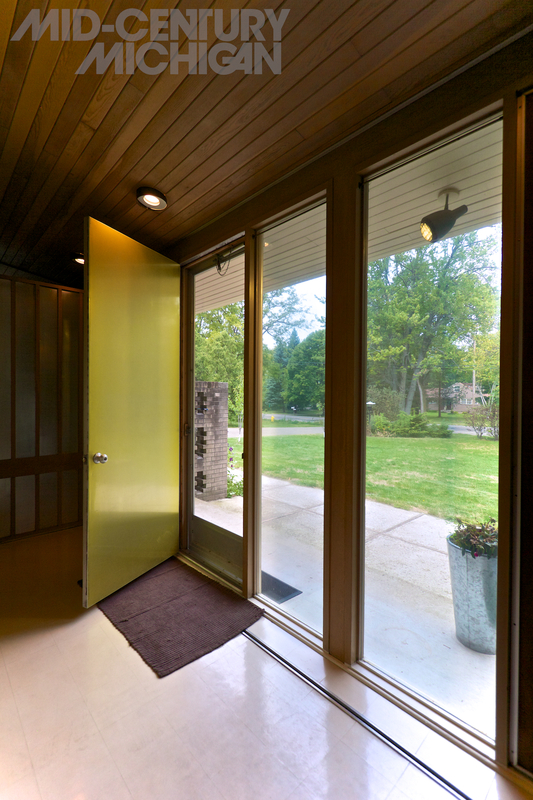 For example, many of the aluminum features in the house are irreplaceable due to their custom stamping and production. 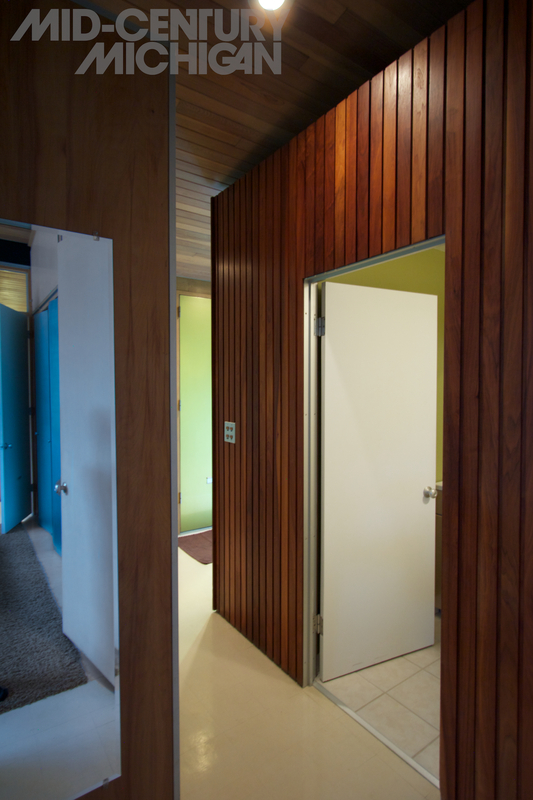 “We have a couple of closet doors that have been dented through the years, and I don’t know what to do about them. I want them fixed,” Jon says “but I don’t know what to do to have them repaired.” Originally, the vertical windows that grace the side of the house once had blue anodized aluminum trellises, which have been removed. For now, they remain safely stored in the shop at the back end of the carport. “I might want to put them back up, but my wife may have other ideas,” Jon says with a chuckle. Charles M. Goodman (1906–1992) studied at the Illinois Institute of Technology until 1928, and trained as an architect at the Armour Institute of Technology until 1931. 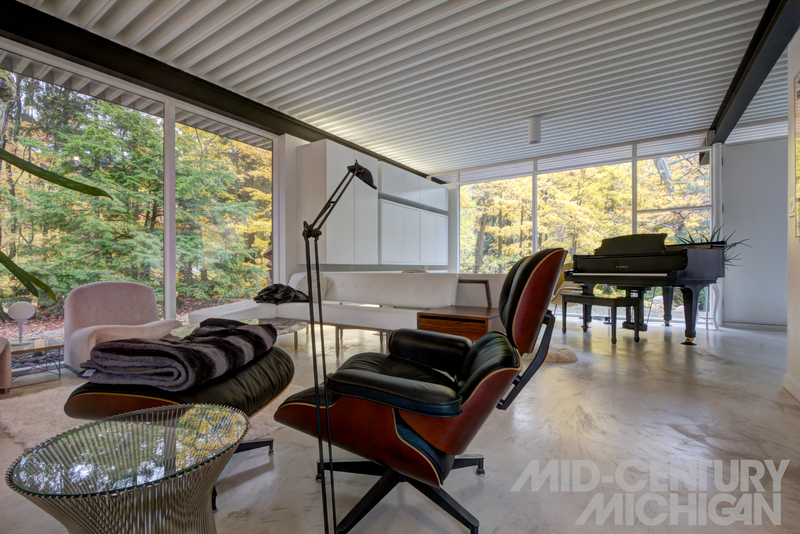 He is perhaps best known for designing and developing the Hollin Hills neighborhood of Alexandria, VA, an enclave of over 300 modern homes sited amidst a wooded backdrop. Another notable work is the Washington National Airport in Washington, D.C. 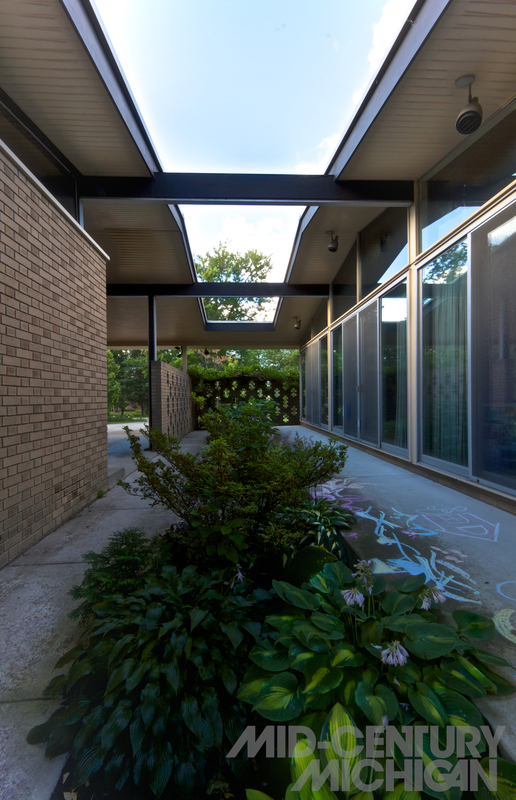 Though Goodman worked as a government architect at the beginning of his career, most of his modern residential works were developed after he founded Charles Goodman Associates in 1946 in Washington, D.C. By 1956, over 32,000 of his houses were built around the country. 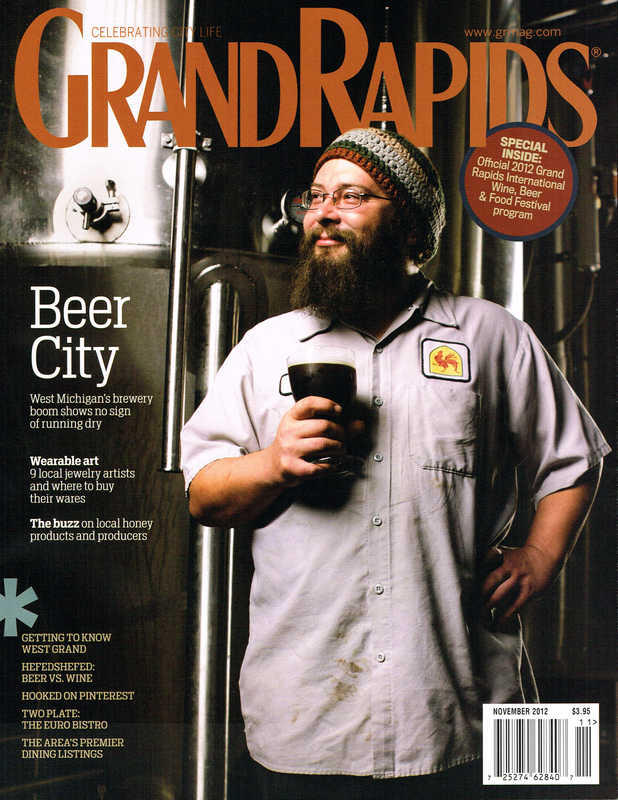 For those of you who live in or around Grand Rapids, keep an eye out for the November 2012 issue of Grand Rapids Magazine. 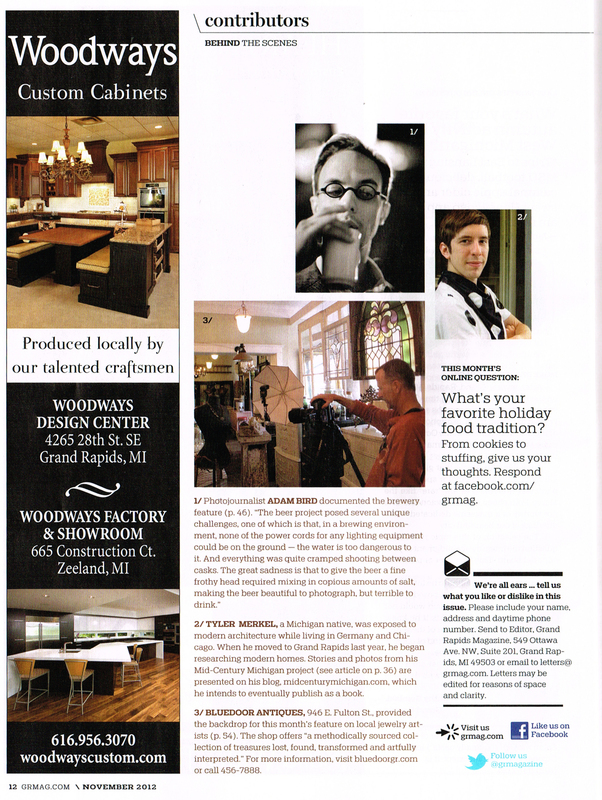 There you will find a Mid-Century Michigan article in print, as well as a write-up in the contributor section about yours truly and this project. If you’ve never read the magazine before, I recommend it! The content is solid, and the articles about local goings-on are always intriguing.